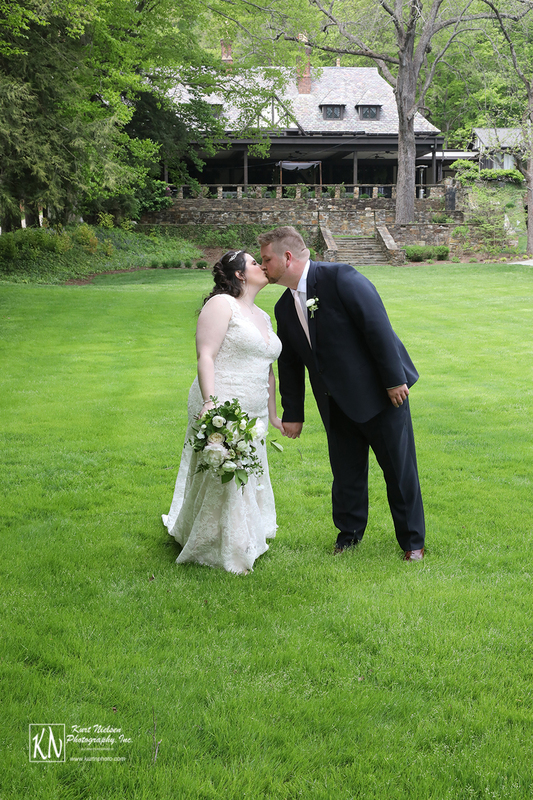 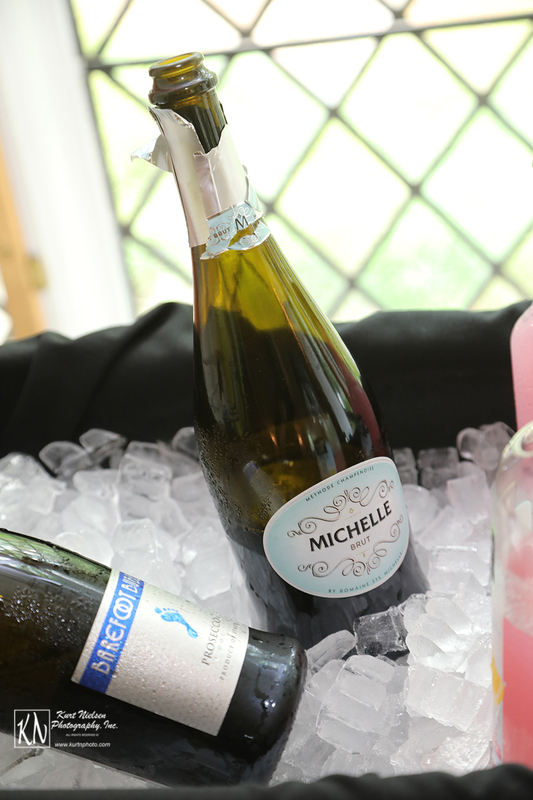 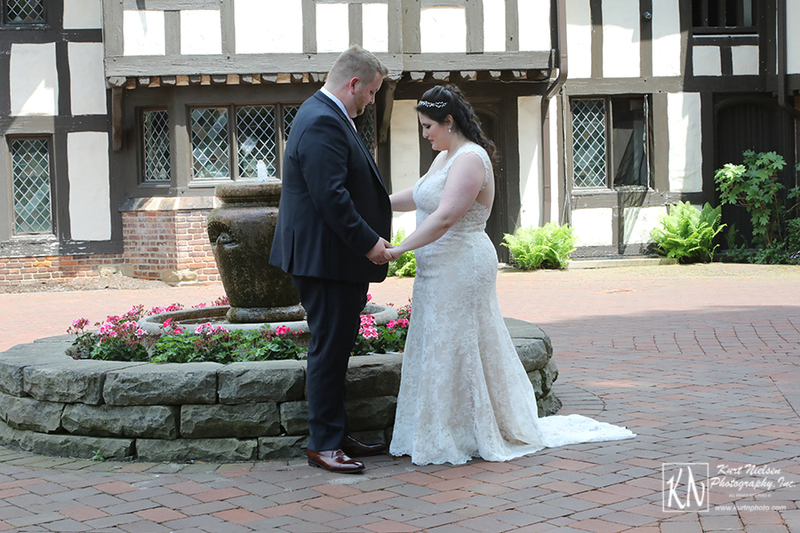 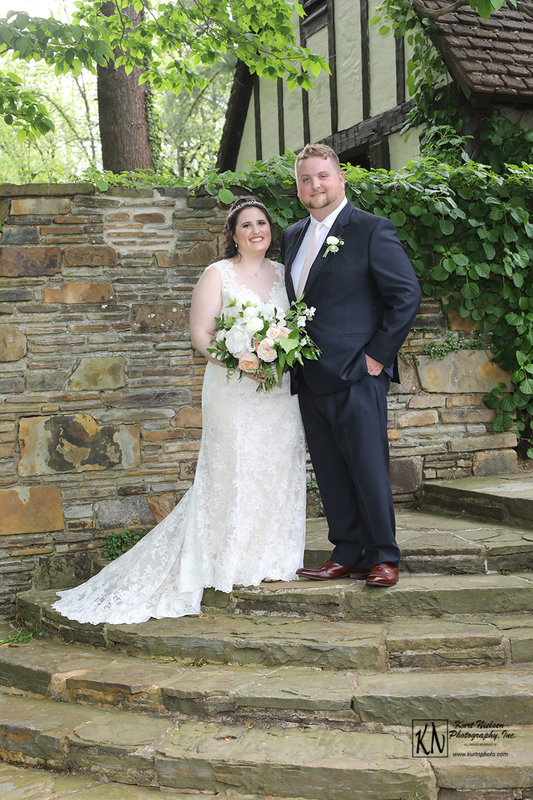 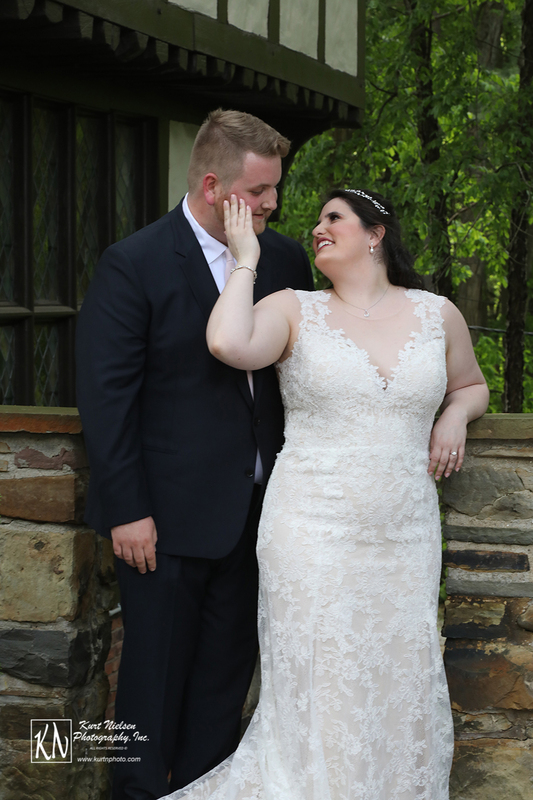 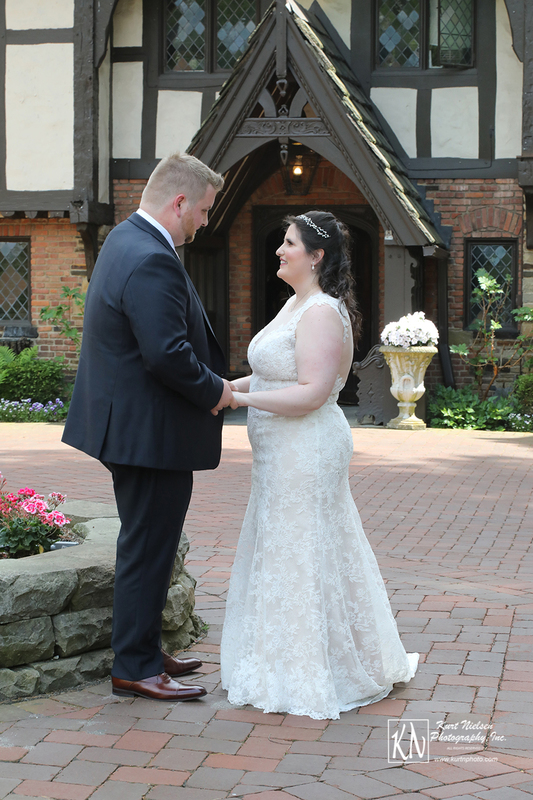 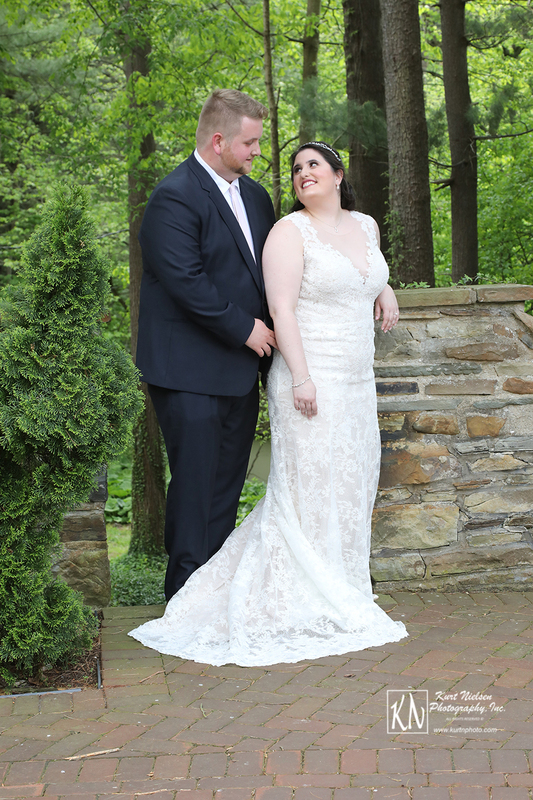 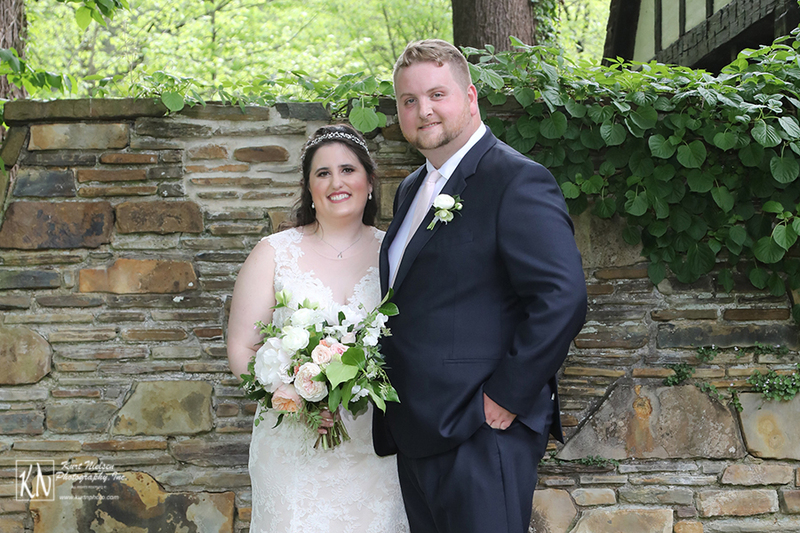 Michelle and Paul were married on May 19 in a beautiful garden-inspired outdoor ceremony. 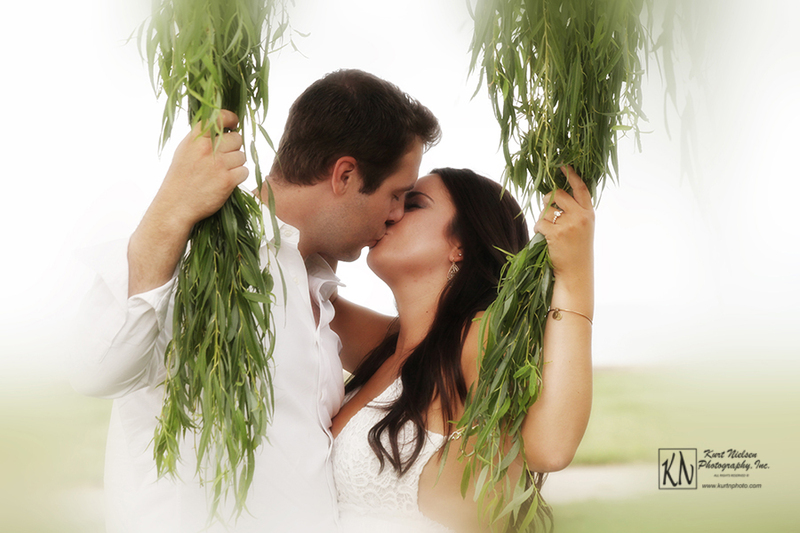 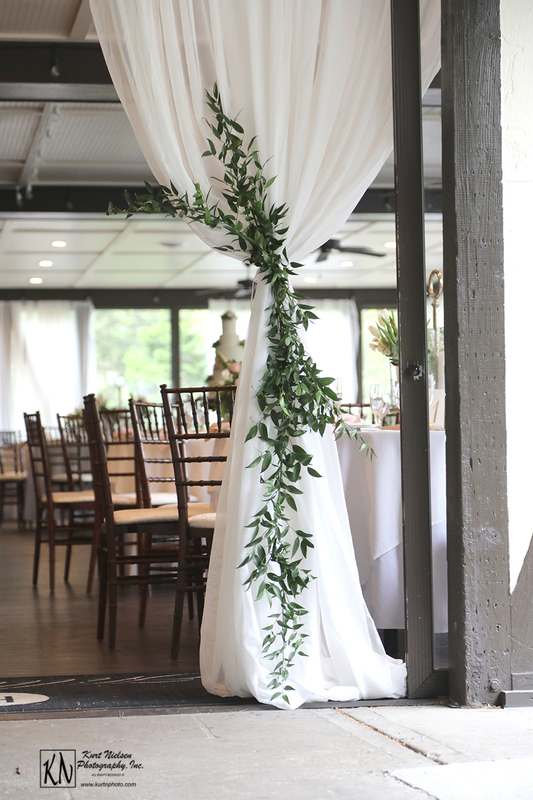 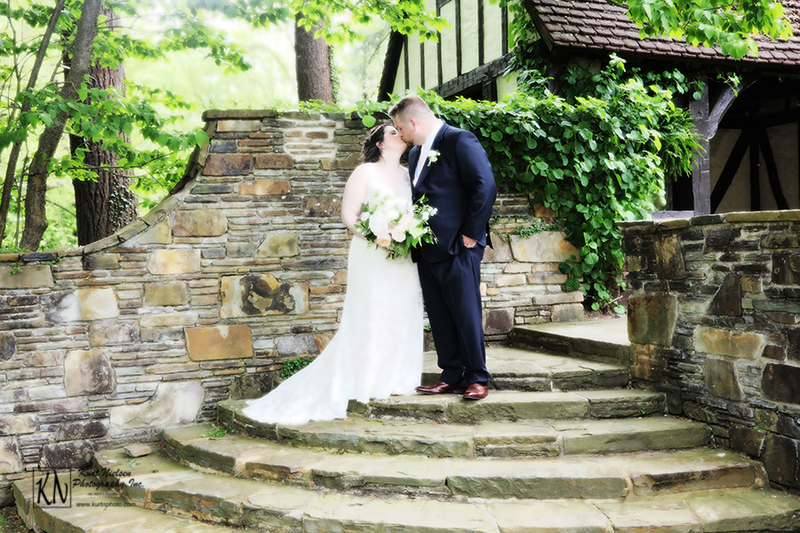 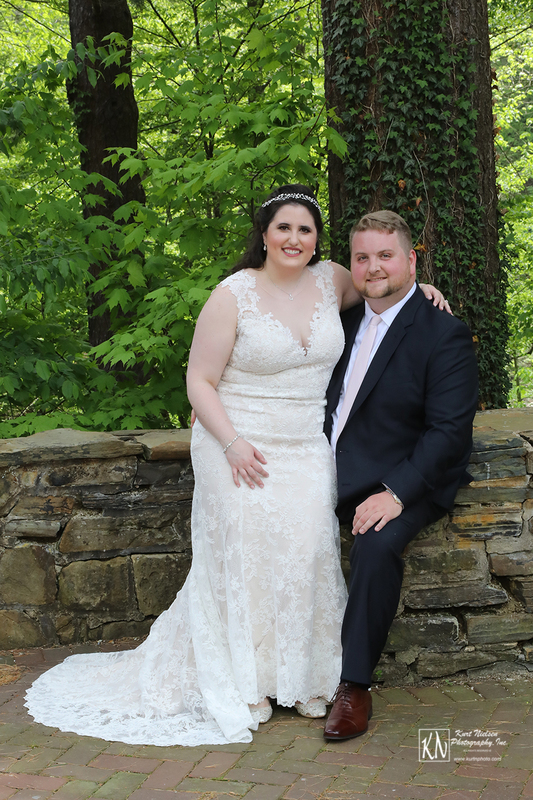 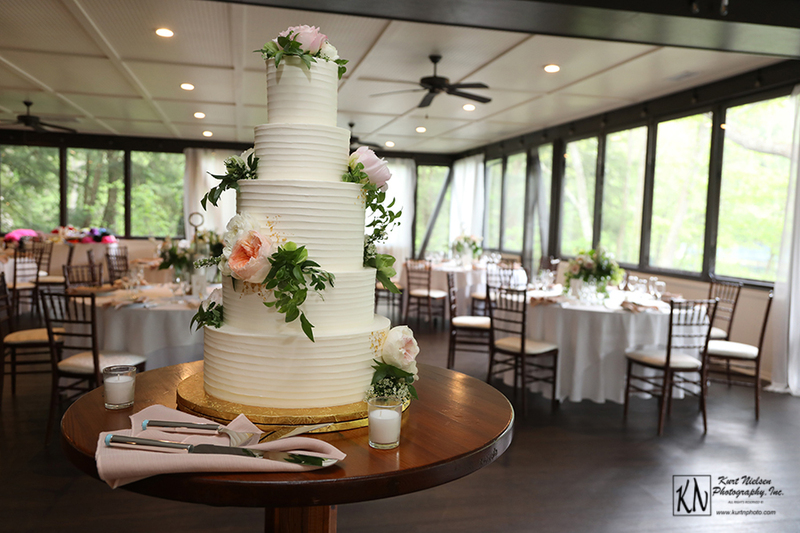 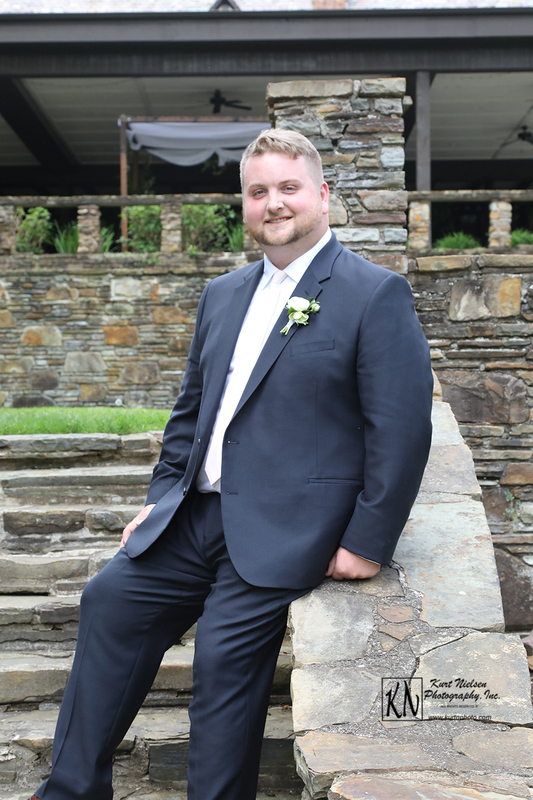 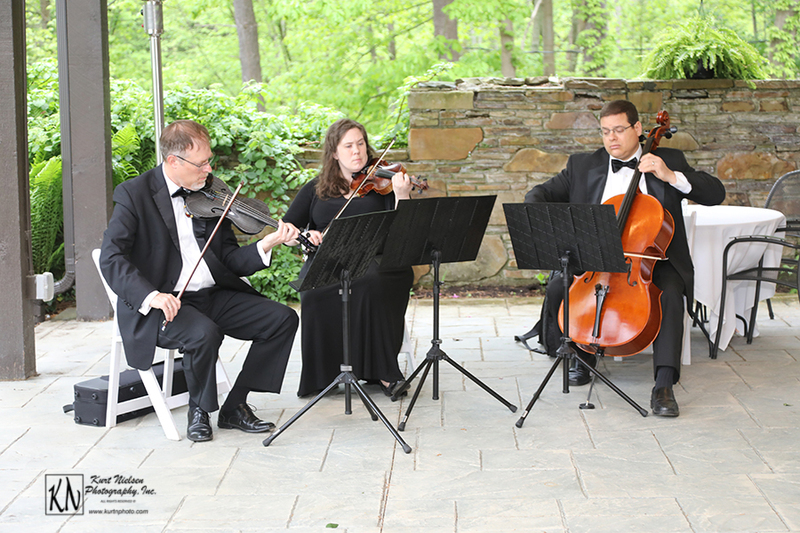 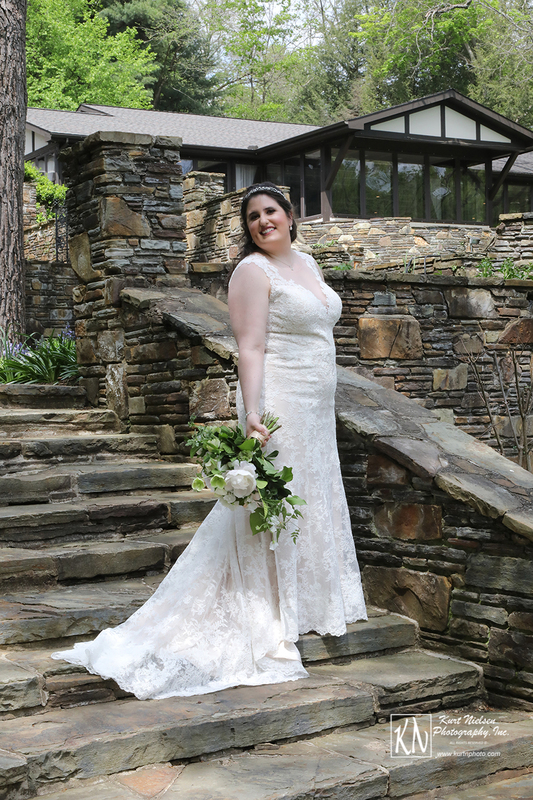 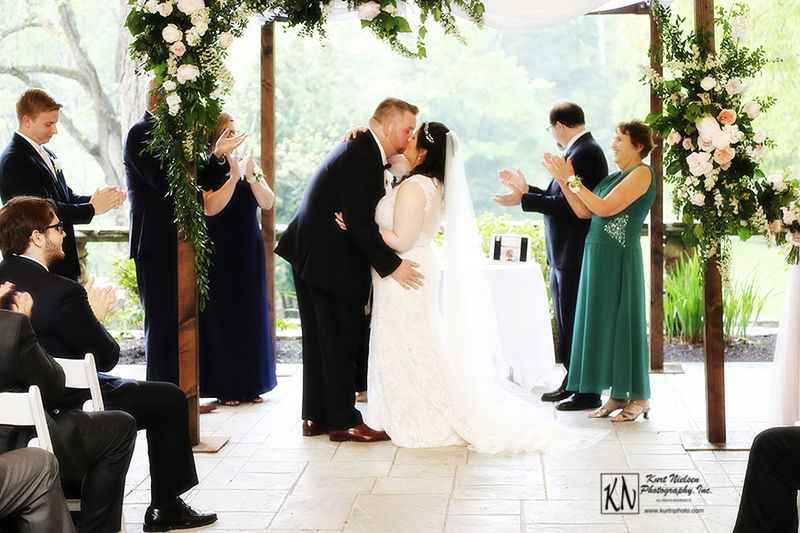 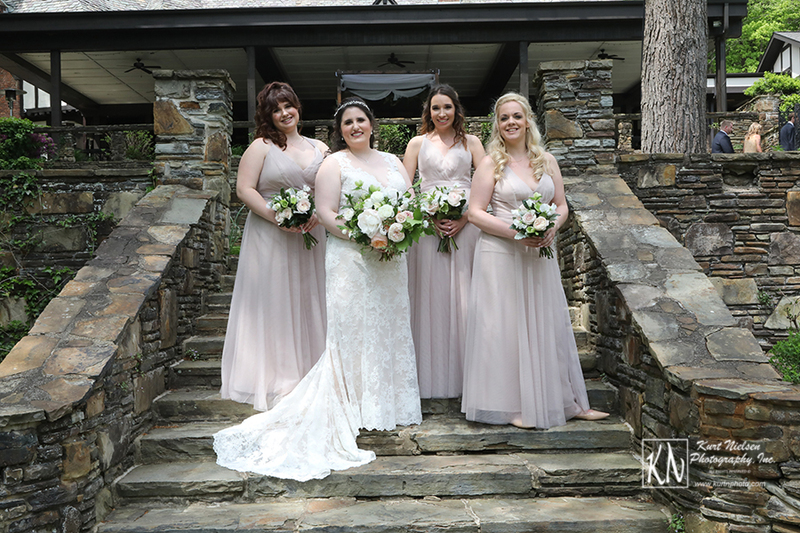 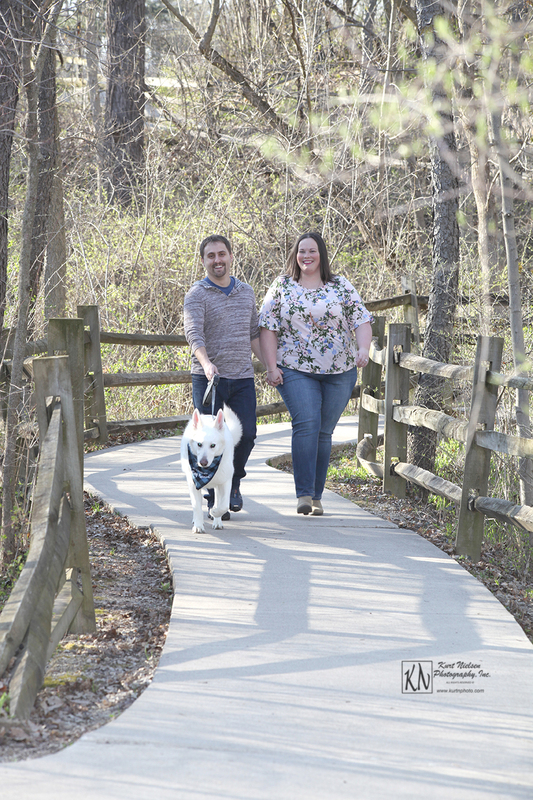 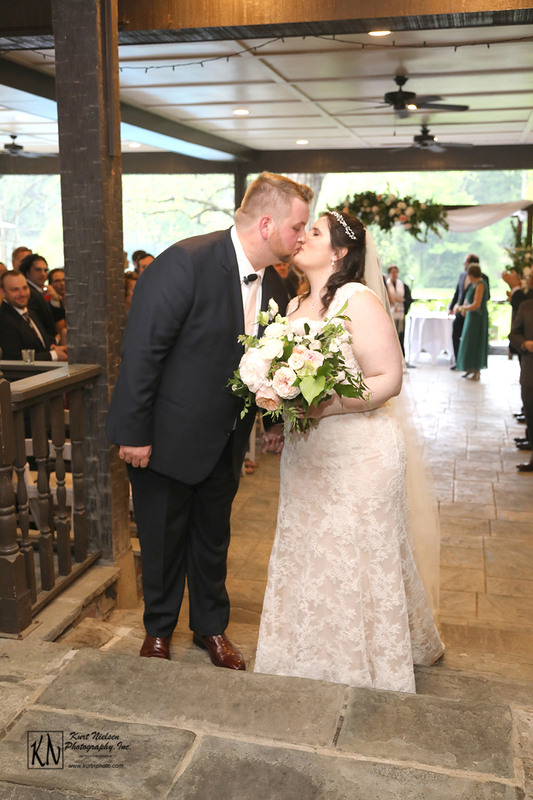 Their love for nature and the great outdoors led them to The Club at Hillbrook for the ceremony and reception venue. 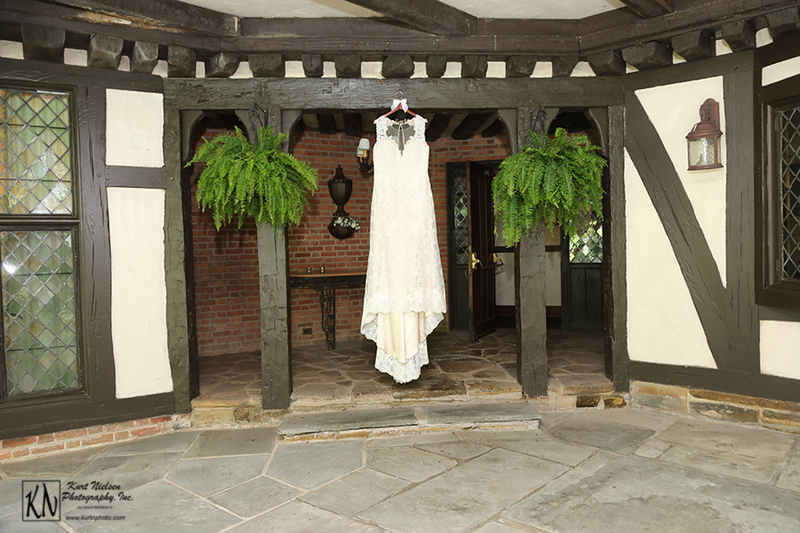 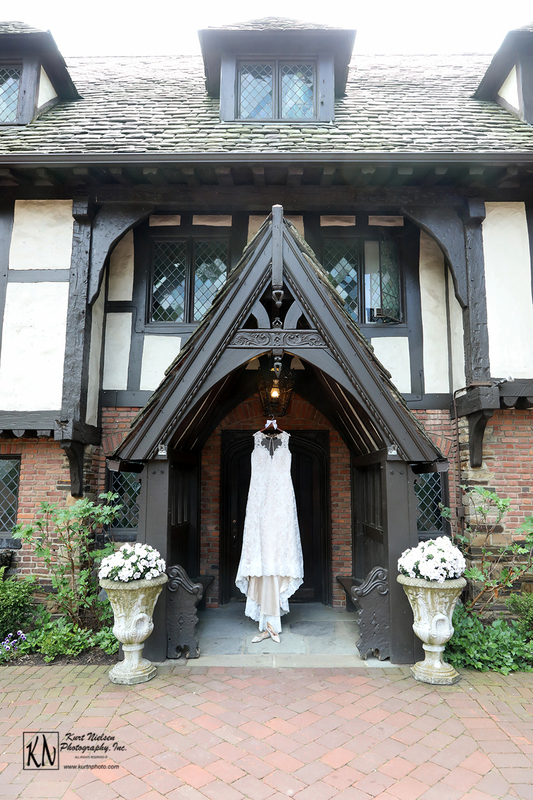 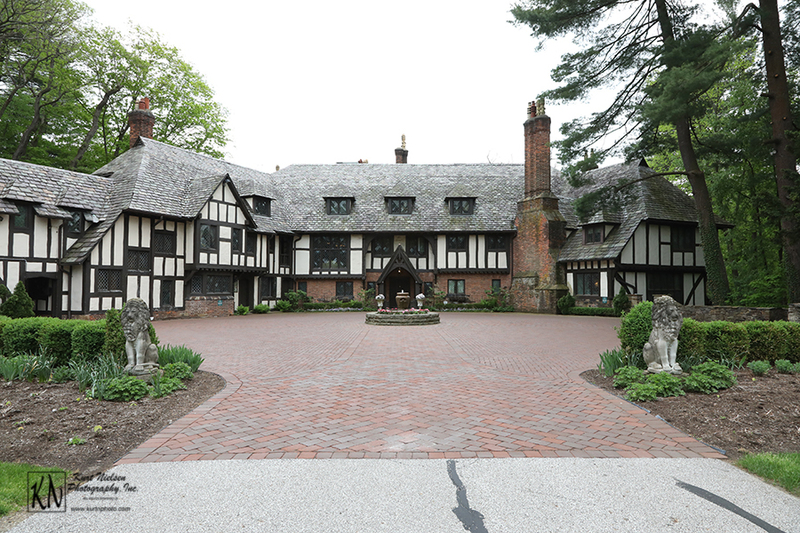 This 40 room Tudor mansion sits on 50 picturesque acres outside of Chagrin Falls, Ohio. 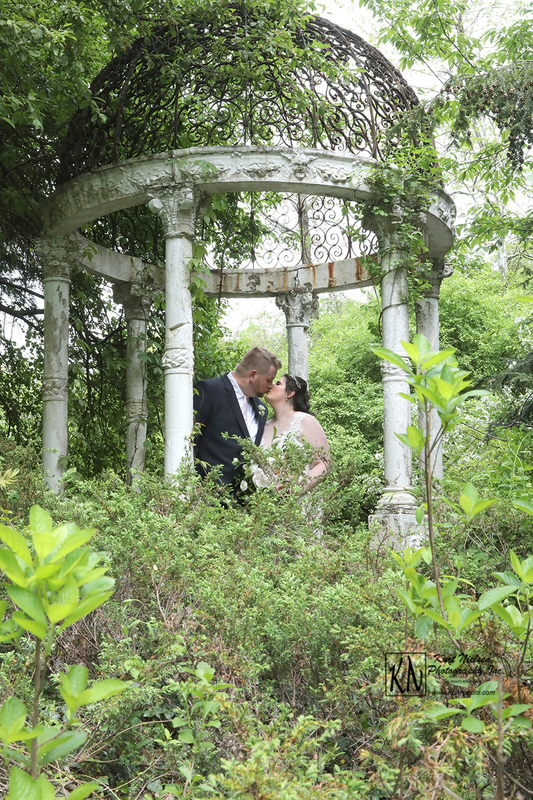 It was built by Edmund S. Burke, Jr. 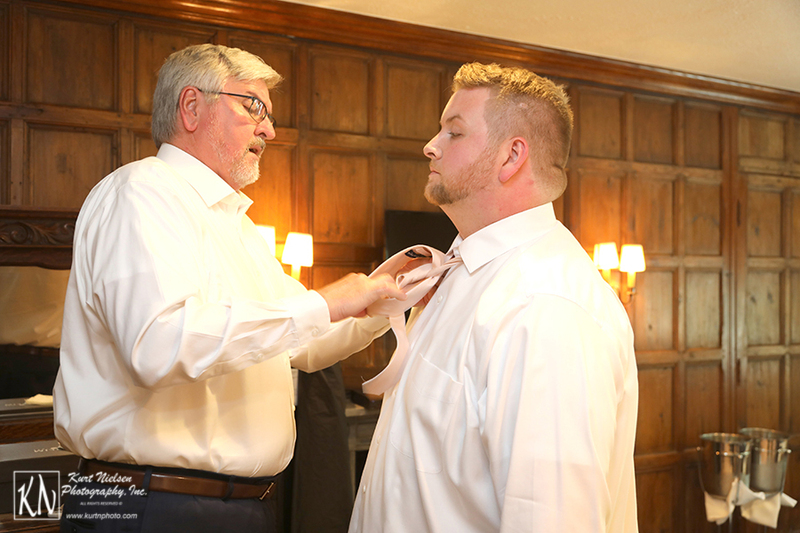 He was the former chairman of the Federal Reserve Bank of Cleveland and founder of what later became known as Bethlehem Steel. 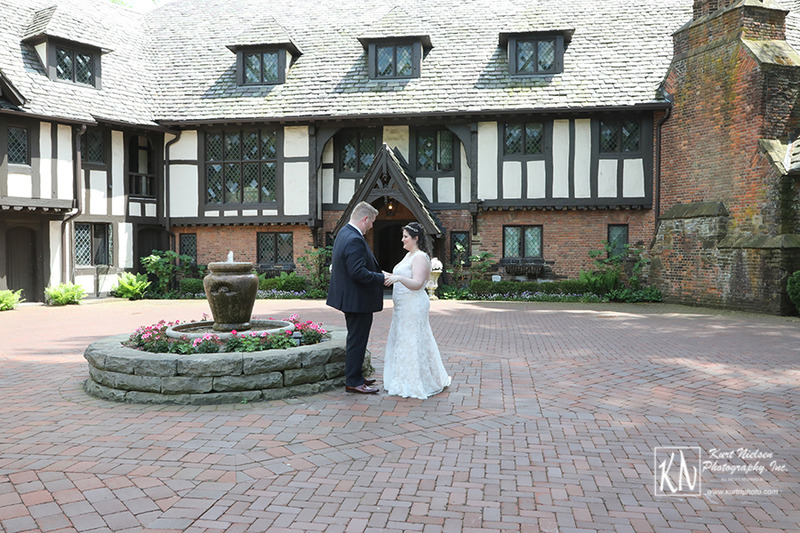 Upon arrival, it was easy to see why the Club at Hillbrook was named as one of the Best Wedding Venues in America by Brides Magazine! 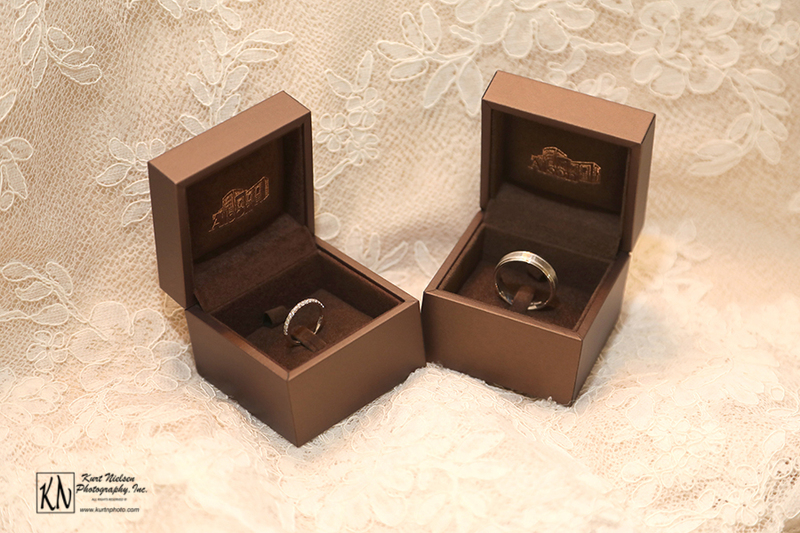 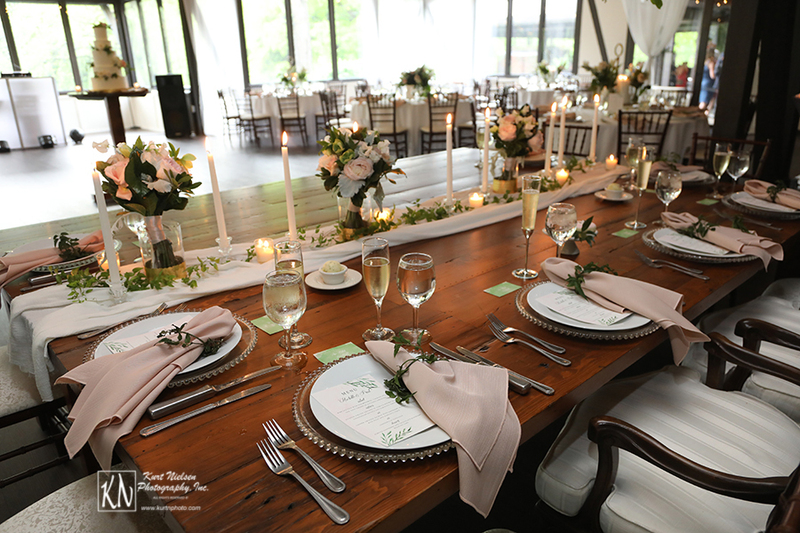 The secluded location and winding road that leads to the Club was also perfect for the couple’s vision for their guests. 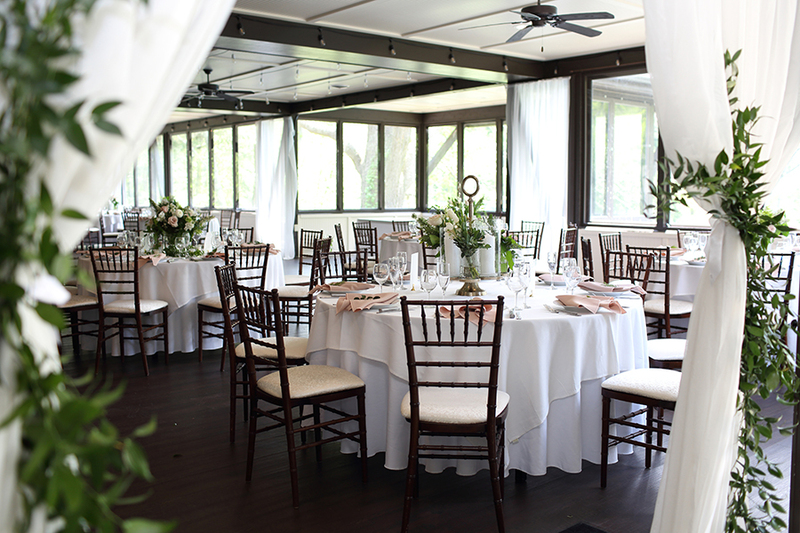 They wanted their venue to make their guests feel as if they were going to a secret elegant party. 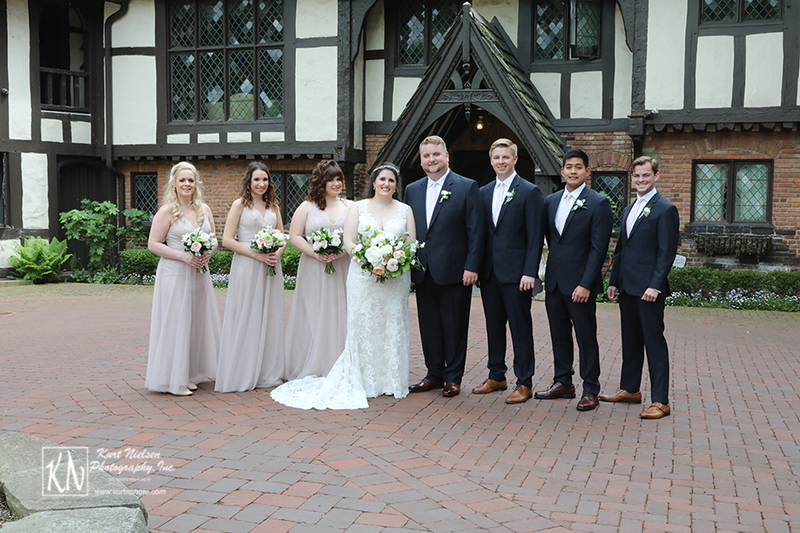 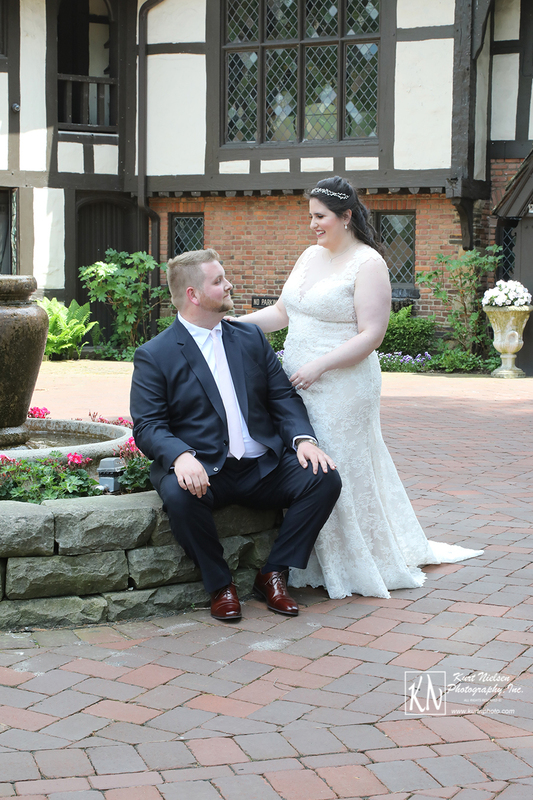 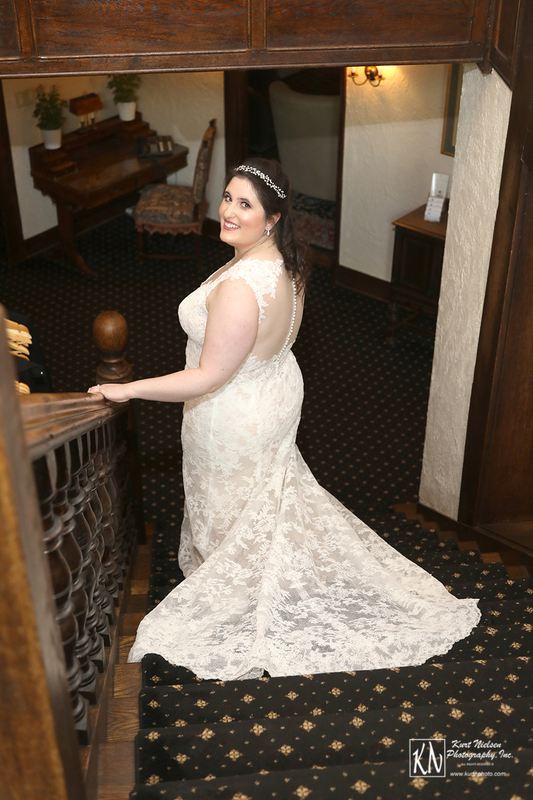 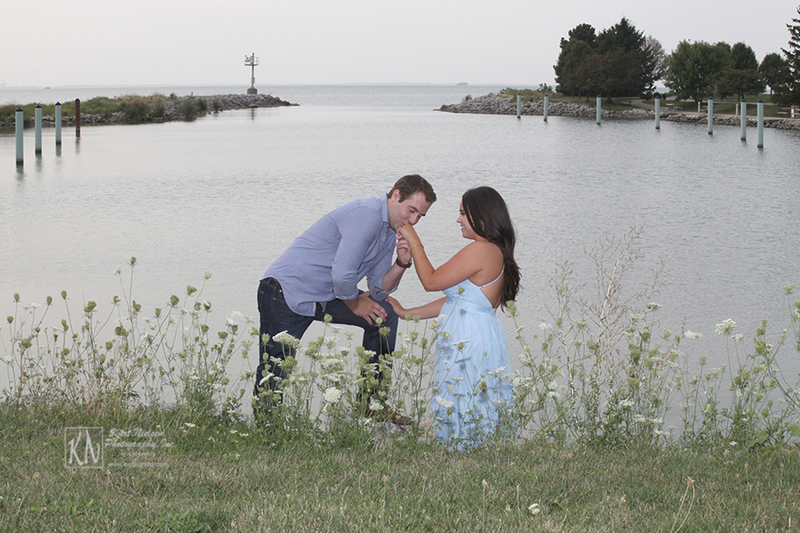 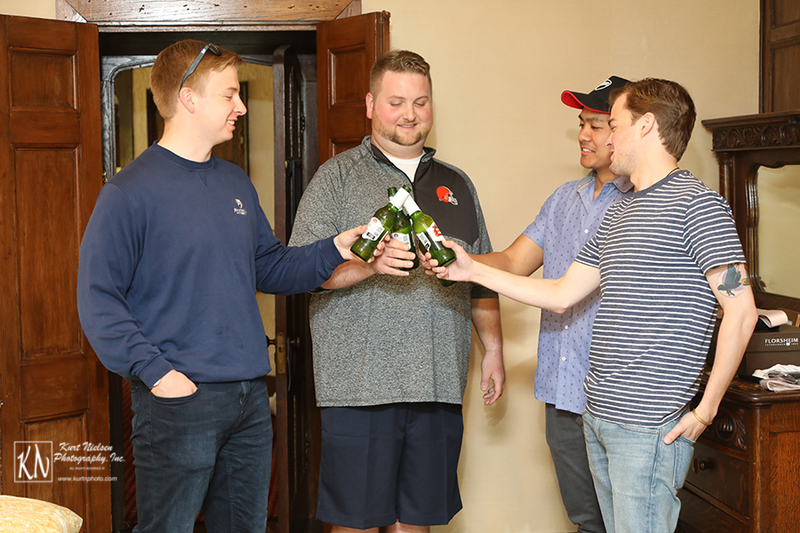 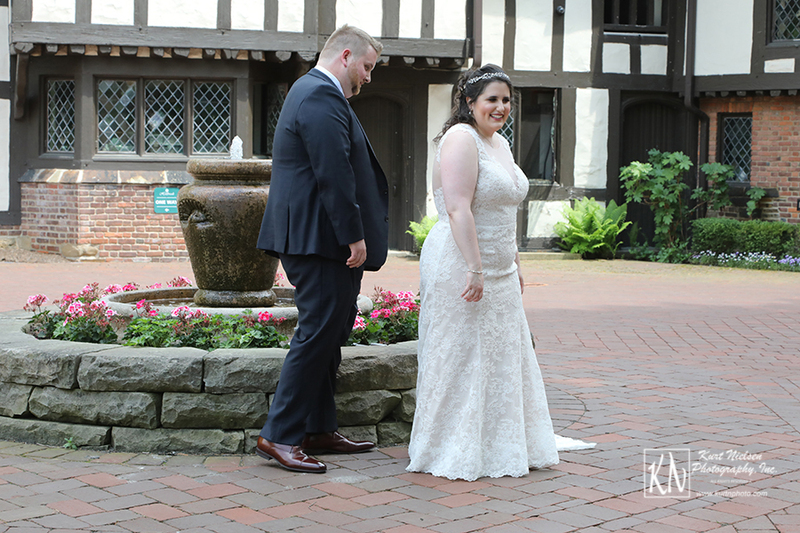 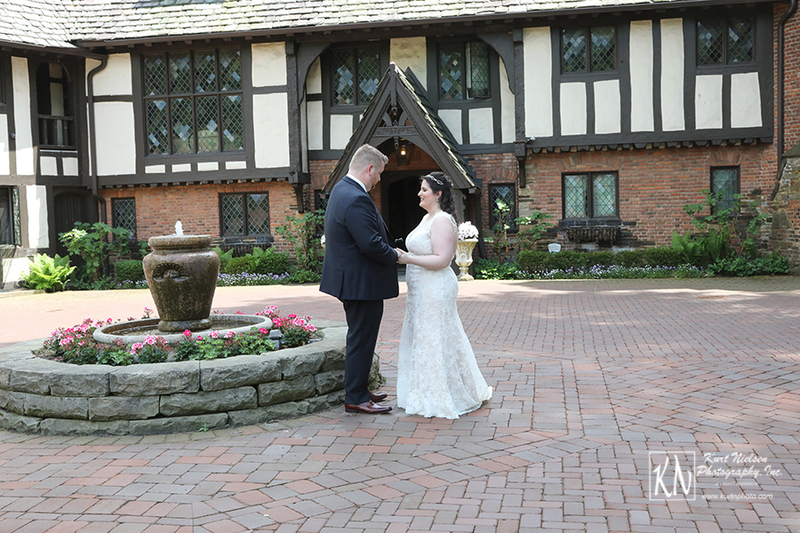 They also wanted to show the natural beauty of the greater Cleveland area since most of the guests were from out of town. 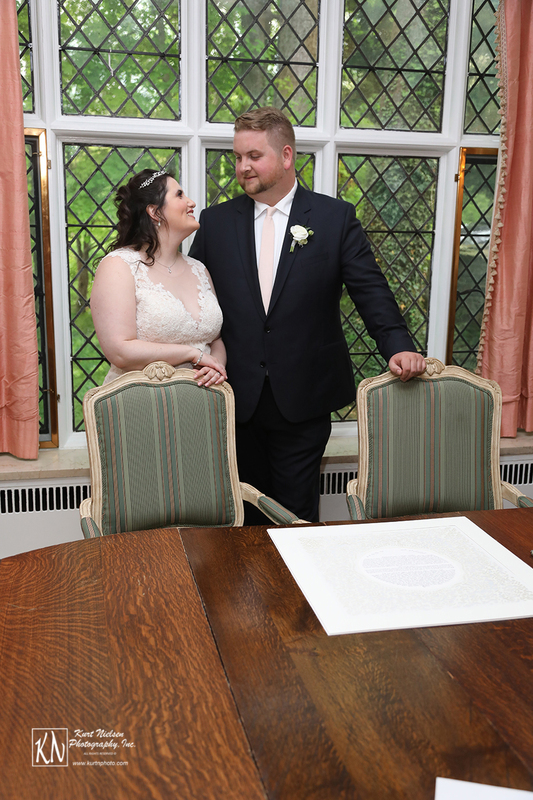 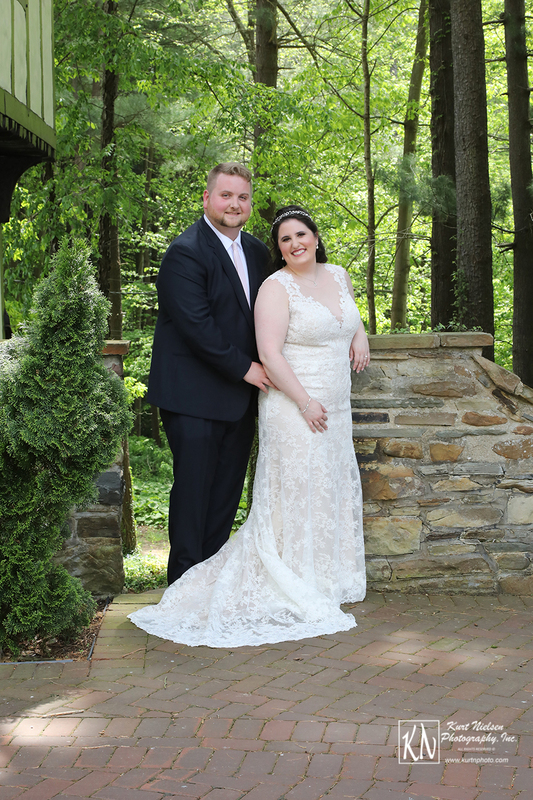 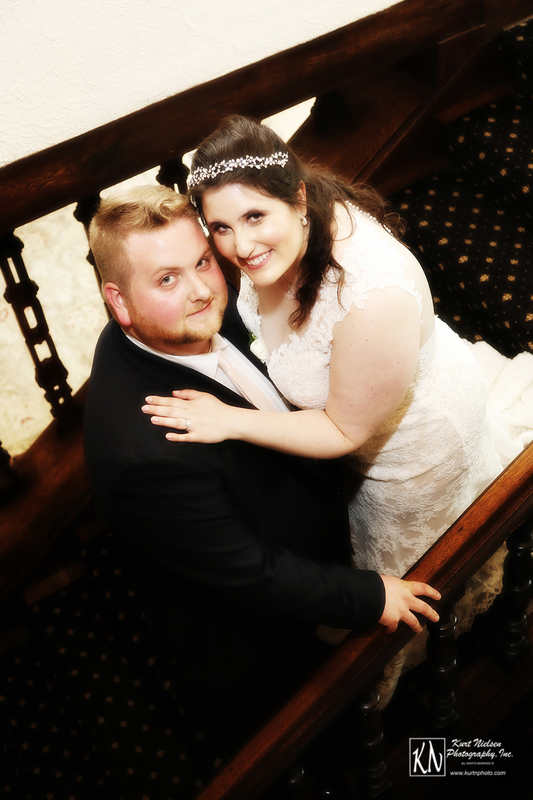 The Club at Hillbrook succeeded in giving Michell and Paul their Fairytale Wedding in the Woods! 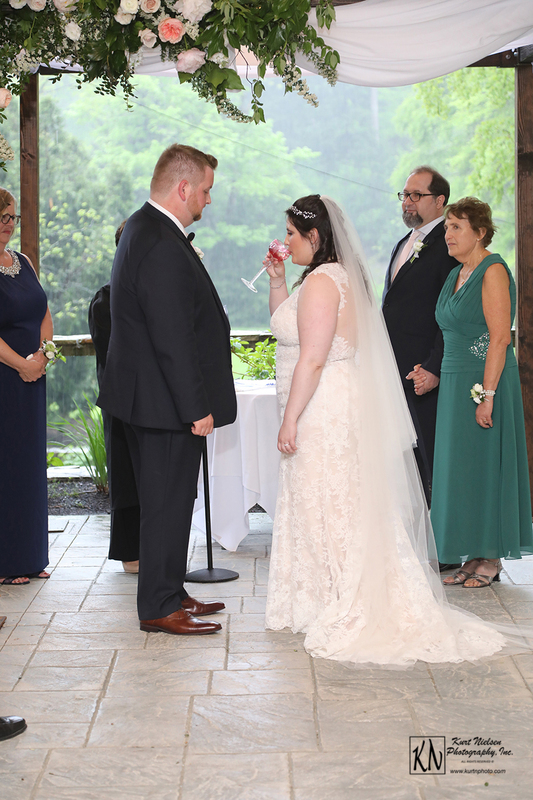 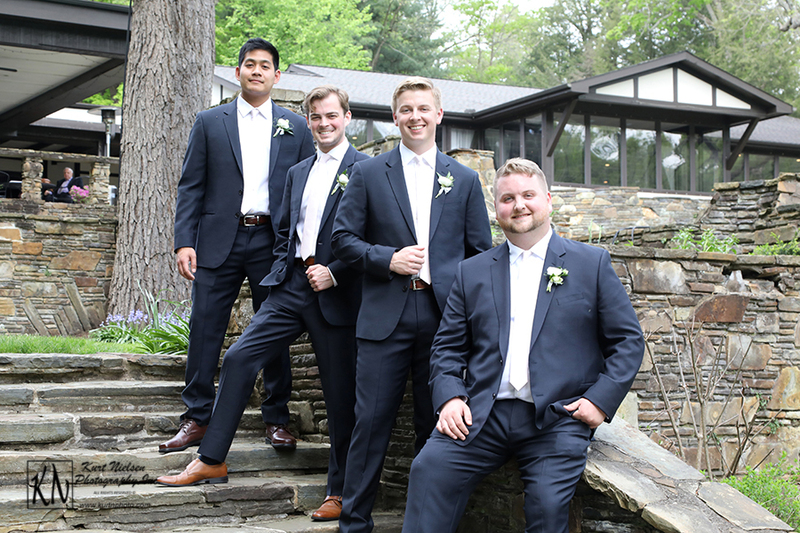 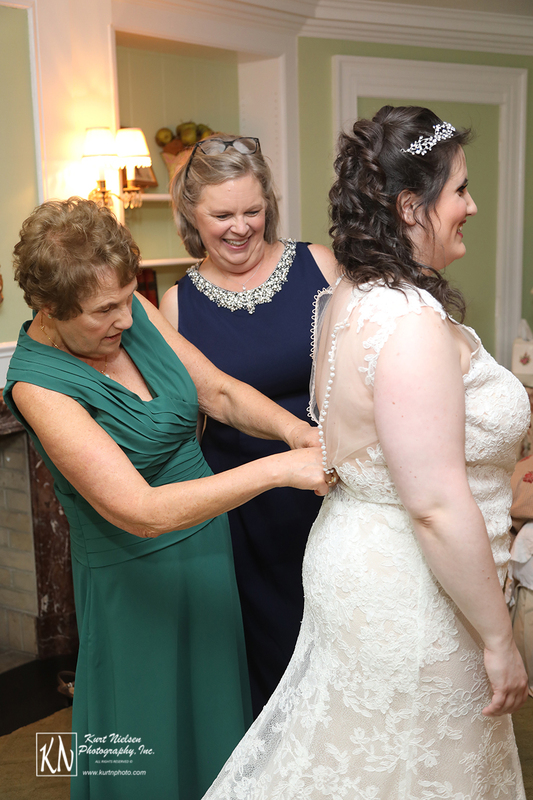 Both the ceremony and reception were held at the Club at Hillbrook. 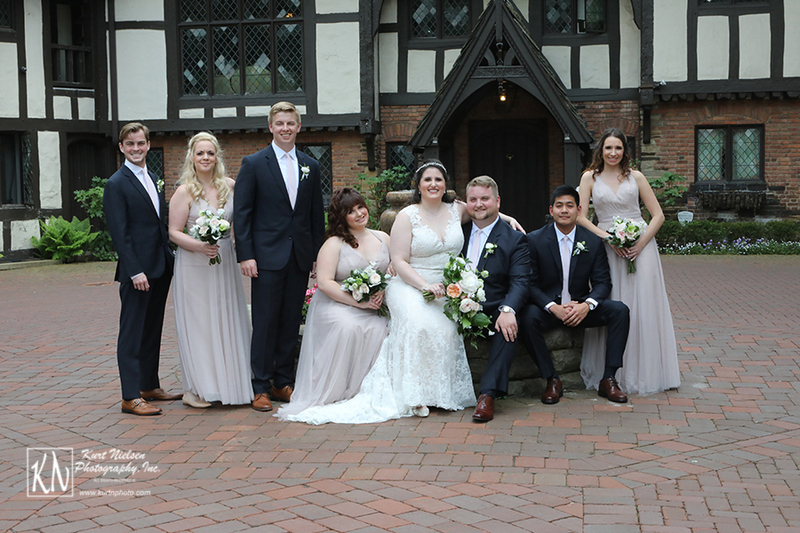 Michelle and Paul and their entire wedding party also got ready there. 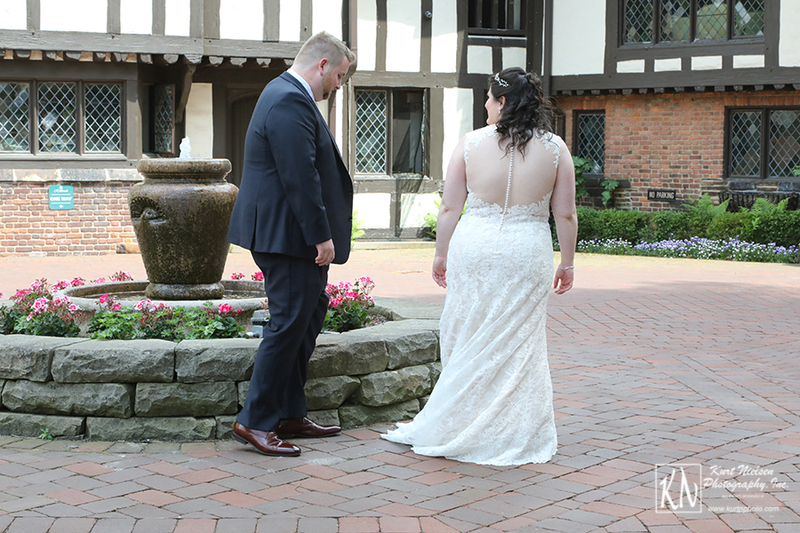 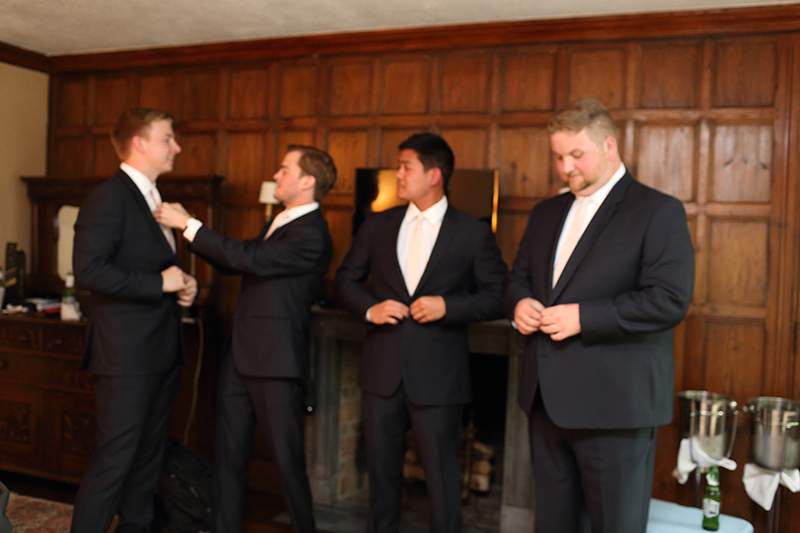 When I arrived, I went straight to work taking the getting ready photos and the detail shots of their attire and accessories. 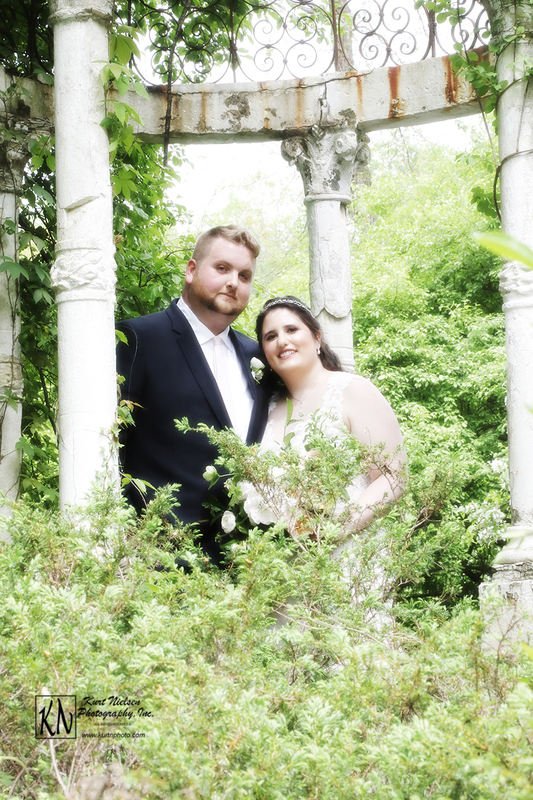 I was soon joined by my second shooter for the day, Julie Paszczykowski. 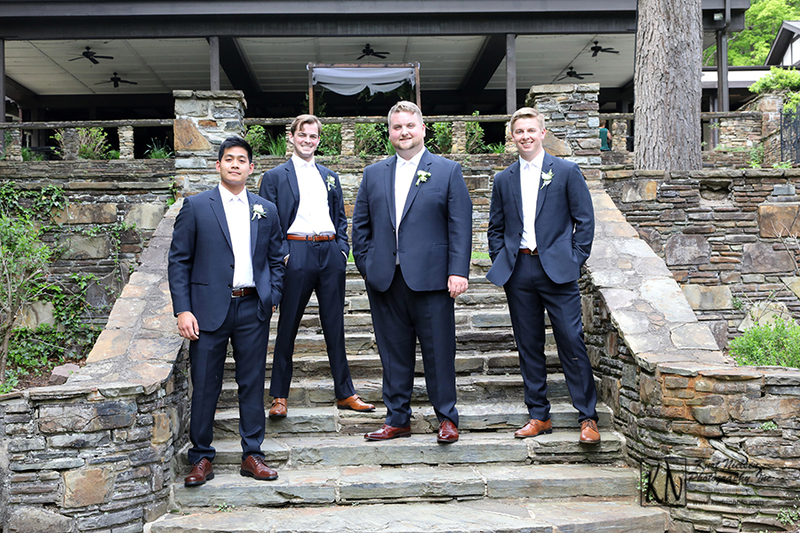 She mainly photographed the guys while I stayed with the girls. 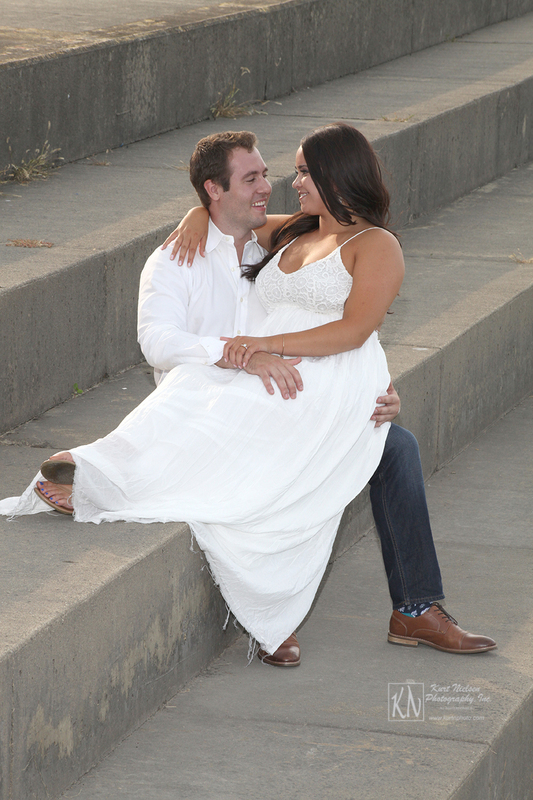 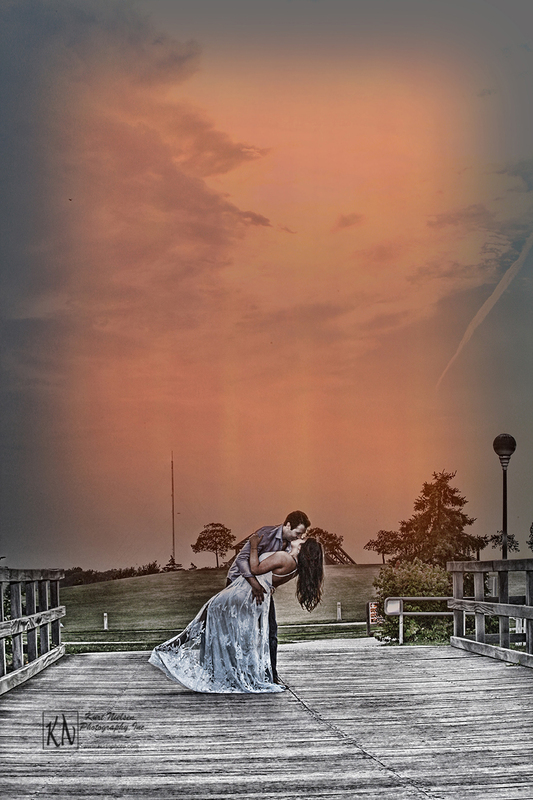 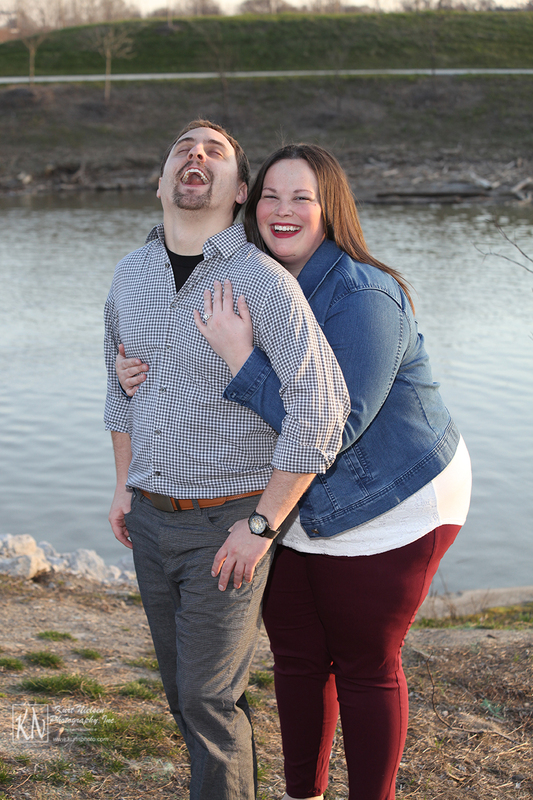 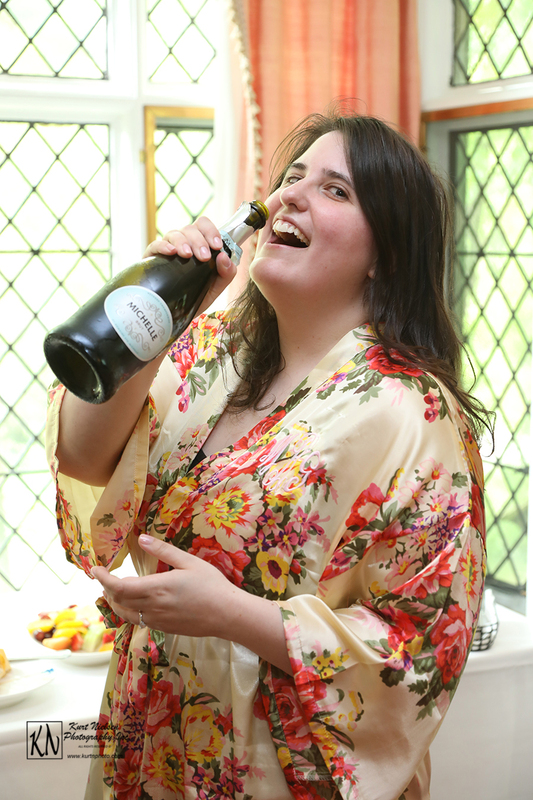 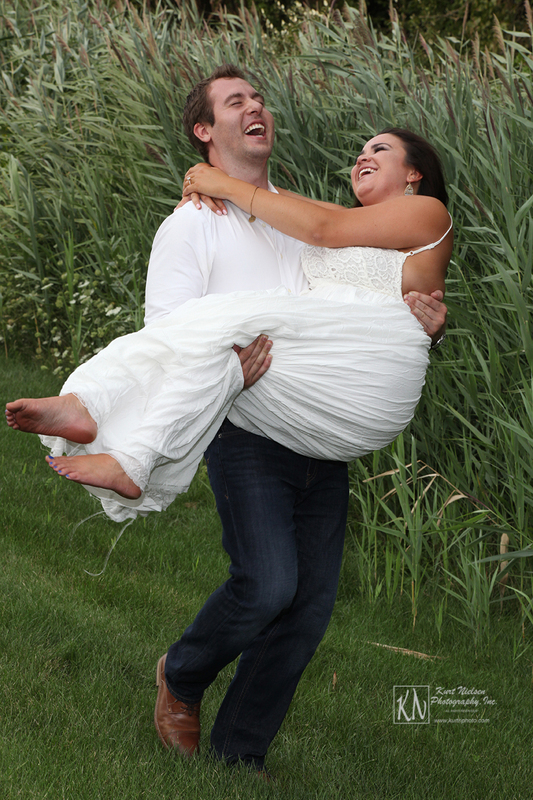 Of course, we each went back and forth between the bride and groom to make sure we had different images for them. 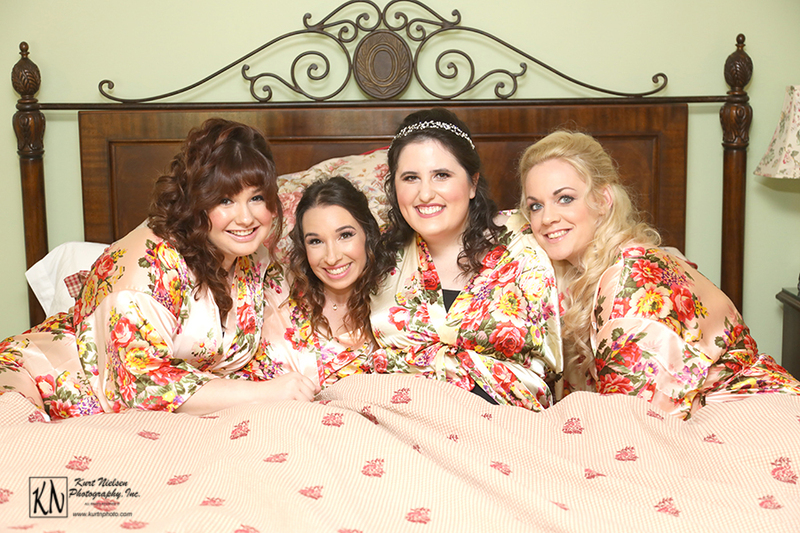 That moment when you are taking photos of the bride with her bridesmaids sitting on the bed. 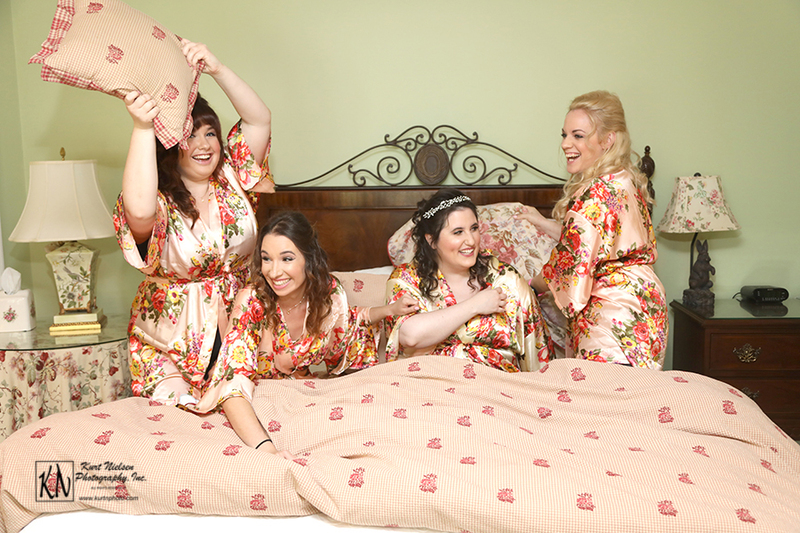 Then you ask them to do something fun and one of them yells “Pillow Fight!” Then they remember they all just had your hair and makeup done! 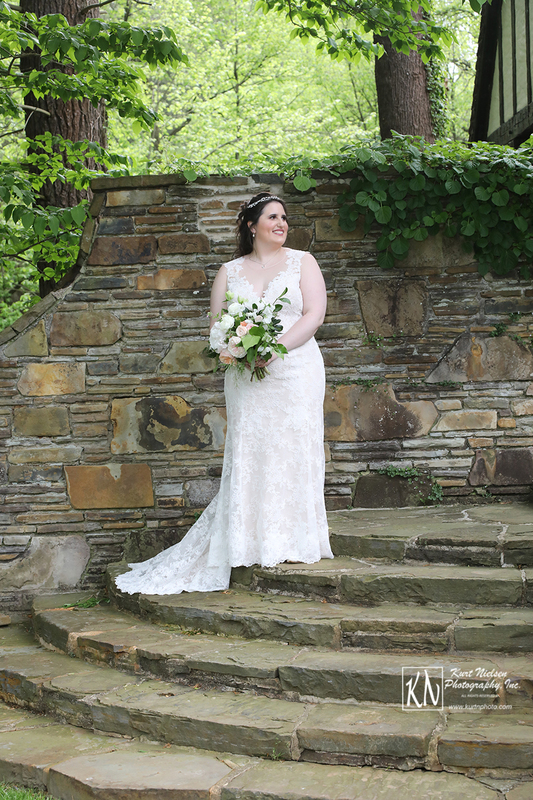 Protect the bride at all costs! 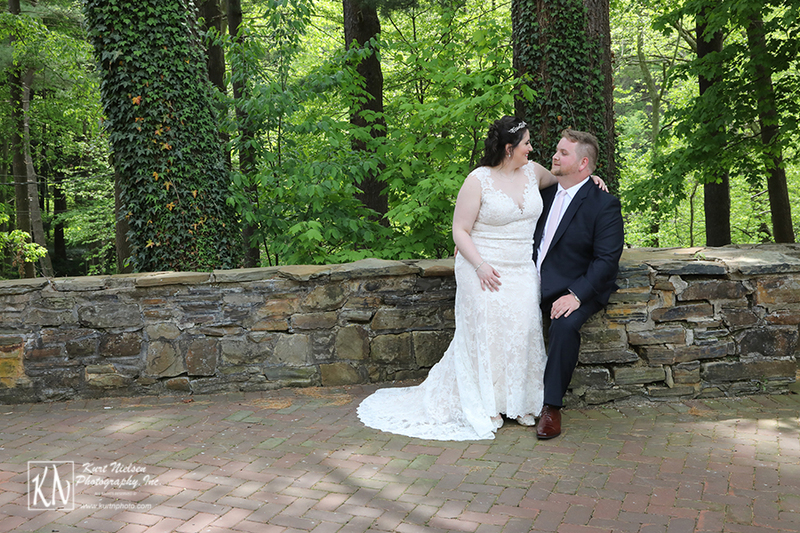 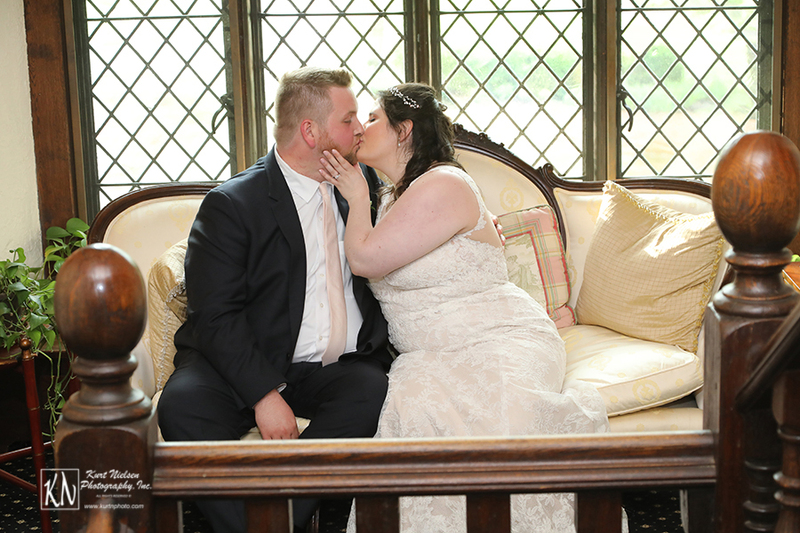 The Interfaith Wedding Ceremony didn’t take place until 5:30 so Michelle and Paul opted for “First Look” photos. 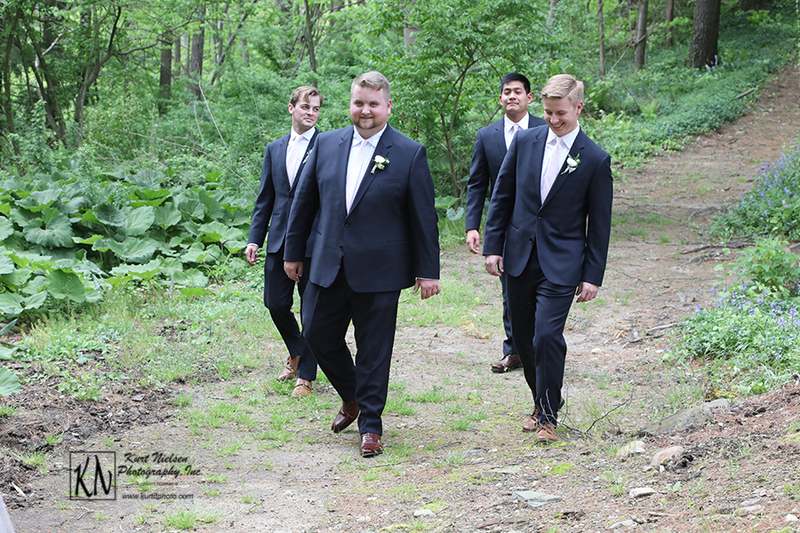 That way, most of the formal photos would be out of the way and they could enjoy their ceremony and reception. 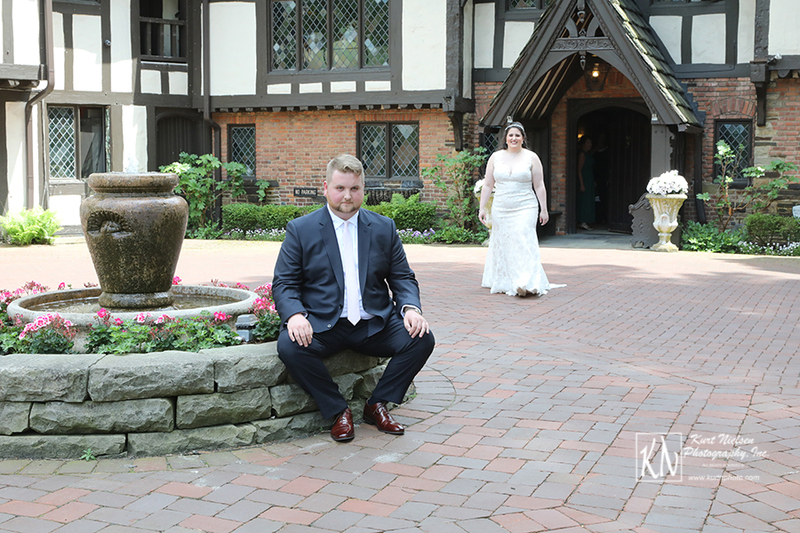 We had the groom go outside first and sit by the fountain with his back to the entry door to the estate. 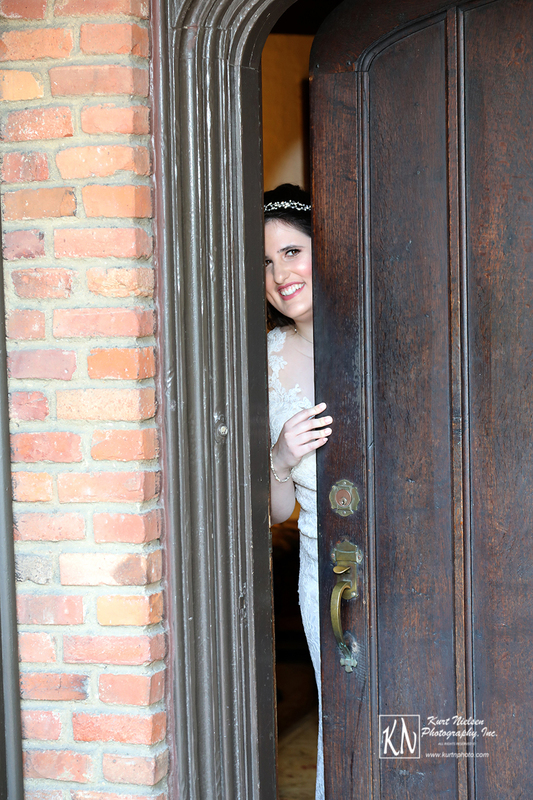 The bride came out after and walked up behind him. 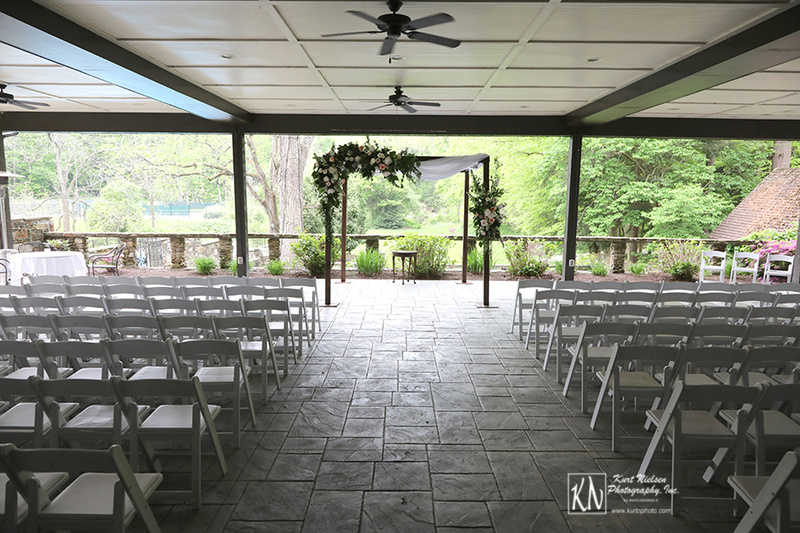 The landscape of the Club at Hillbrook is a photographer’s dream. 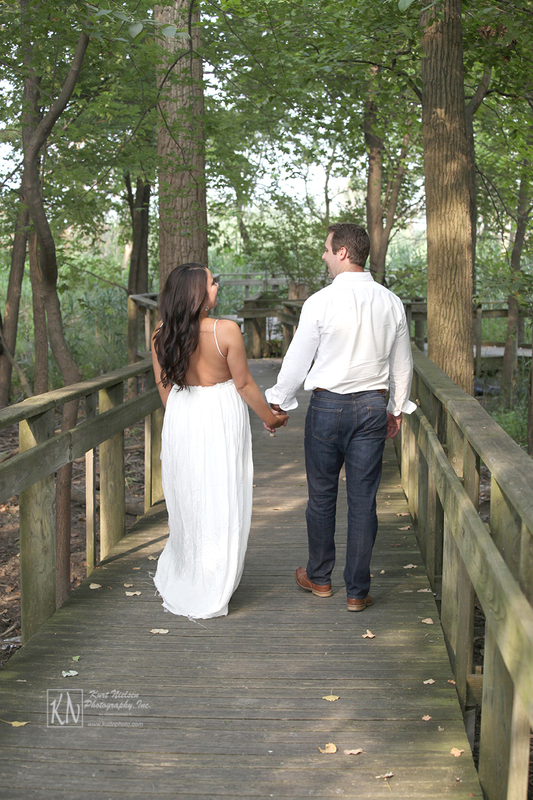 We never had to “scout” for a good spot to take photos. 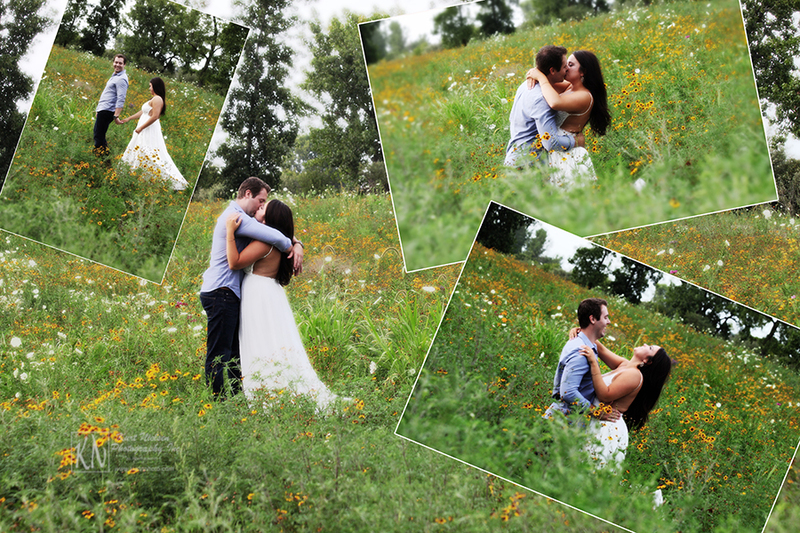 Everywhere was perfect! 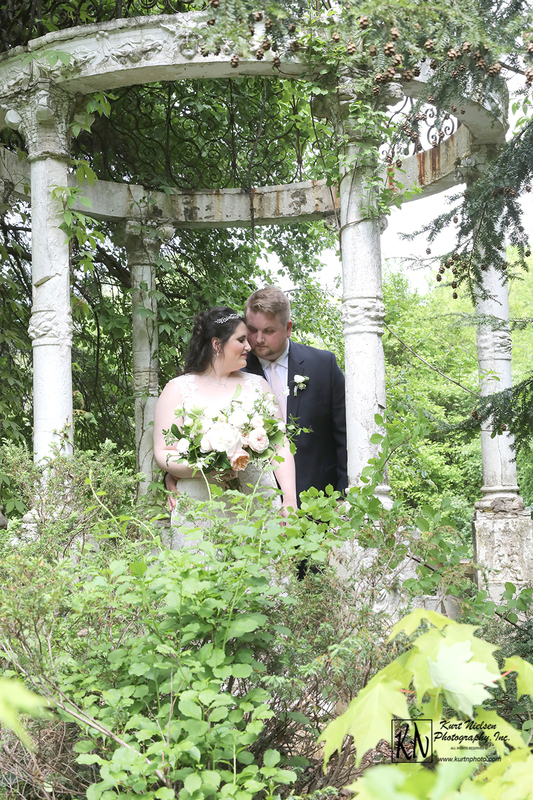 But the Bride and Groom specifically wanted photos in the Gazebo in the back garden. 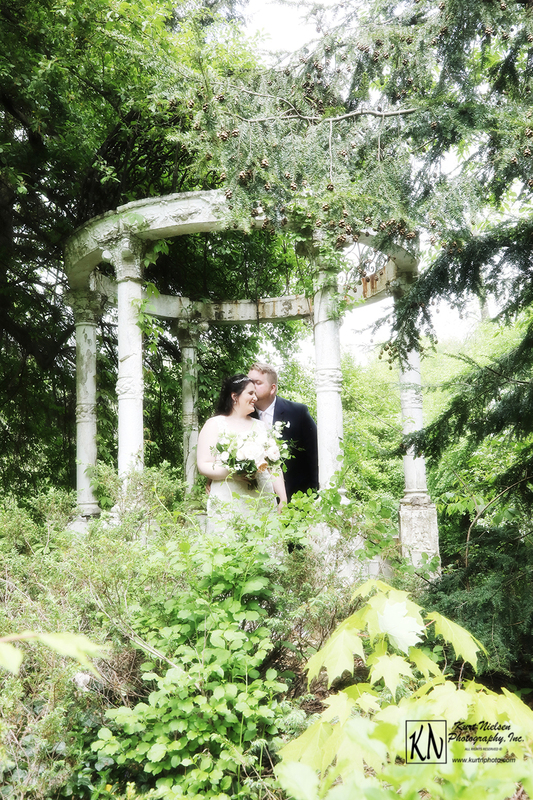 However, getting there was not an easy task. 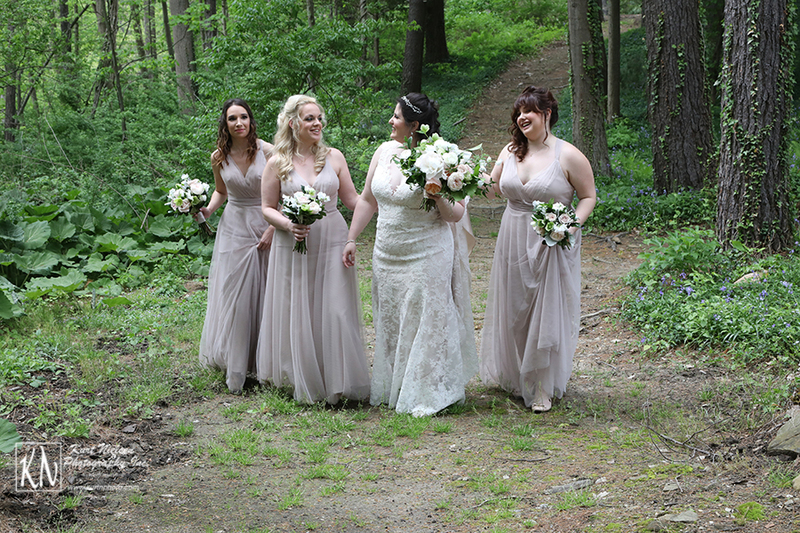 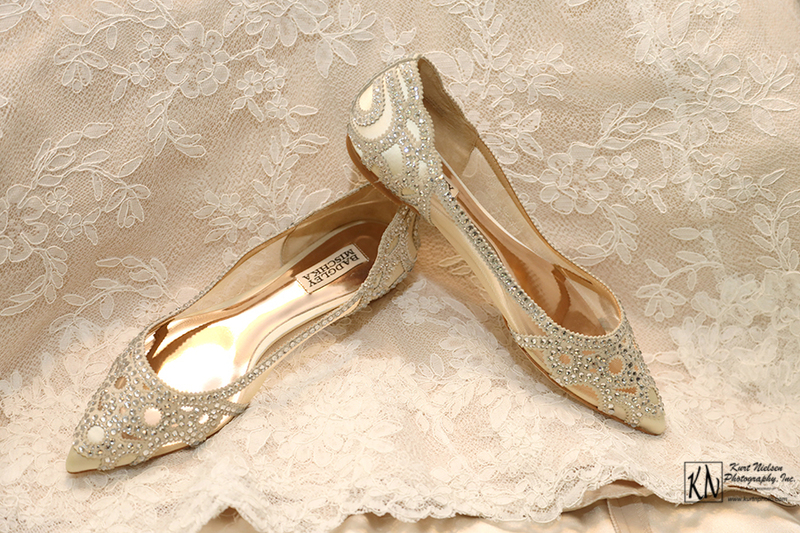 It was a bit of a hike but the bride had on flat shoes and that helped tremendously! 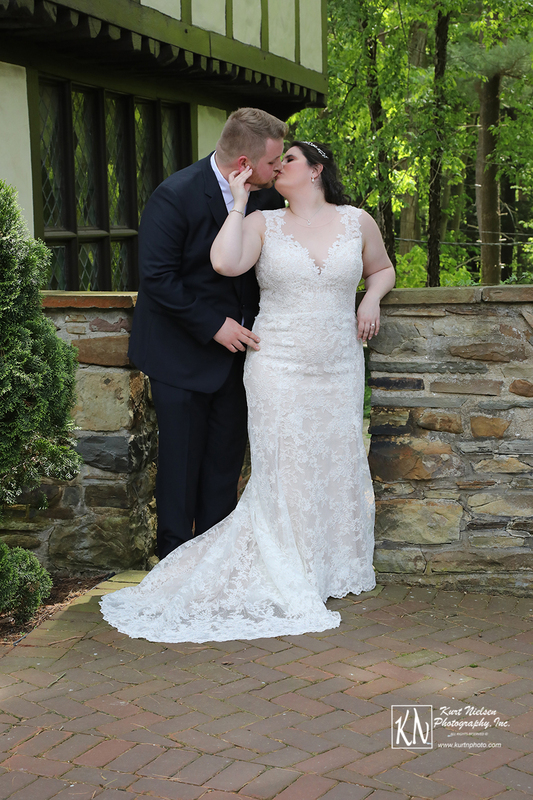 It was definitely worth the extra effort! 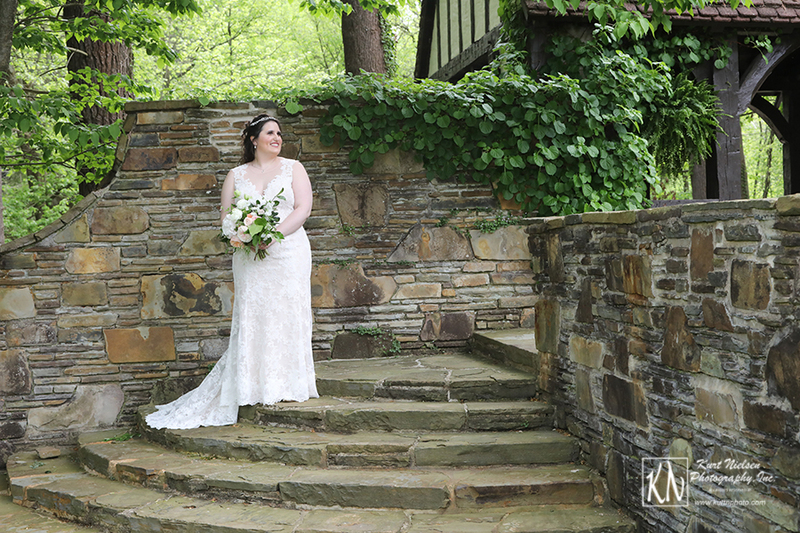 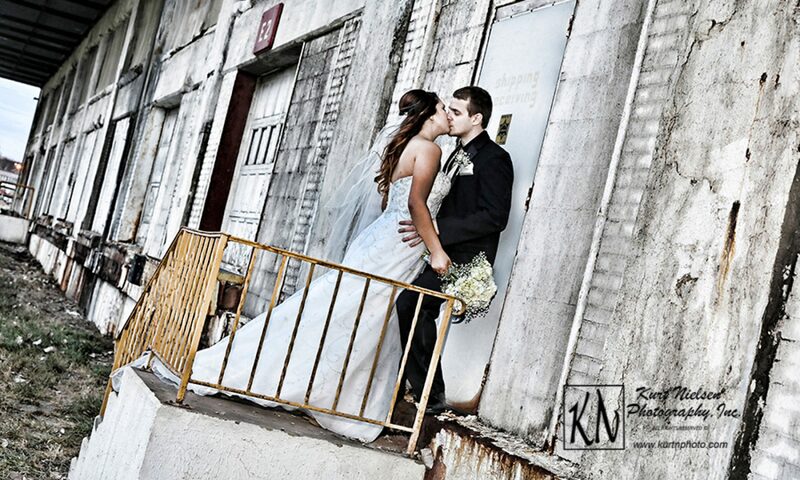 We finished taking the bridal party photos up on the stairs leading to the back patio. 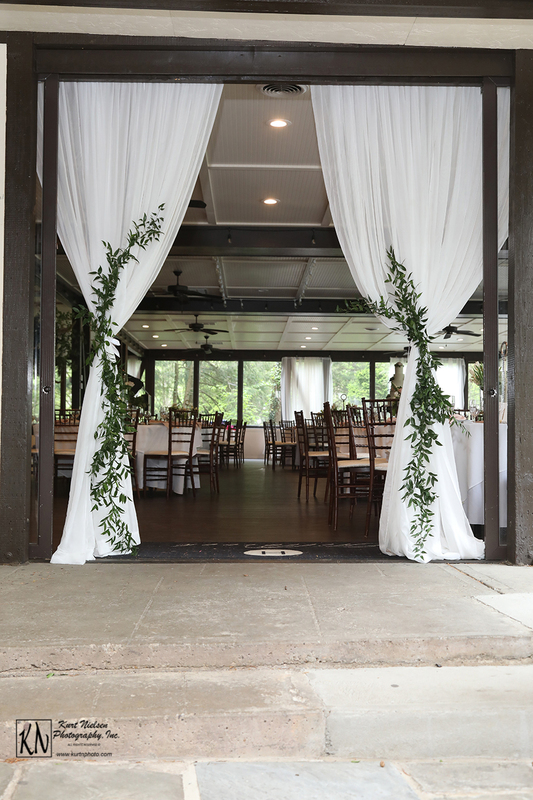 The architecture of the Club at Hillbrook is the perfect backdrop no matter where you are on the property! 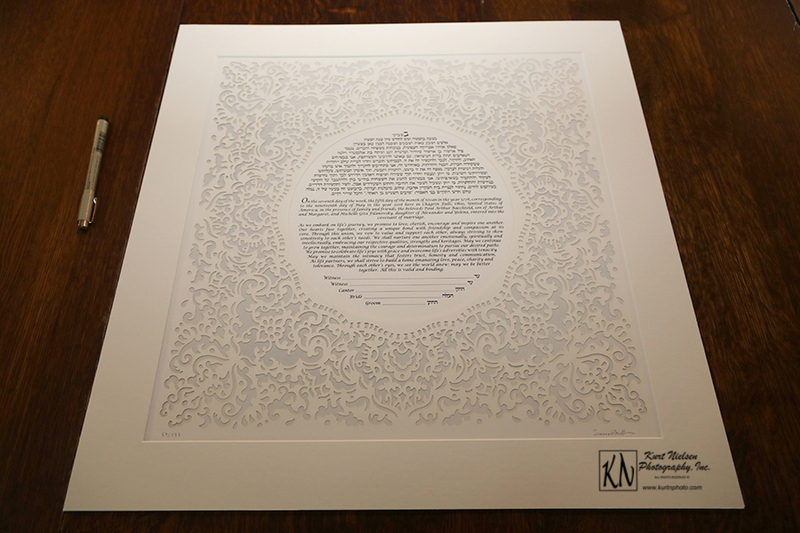 The Ketubah is considered one of the most important parts of a Jewish marriage. 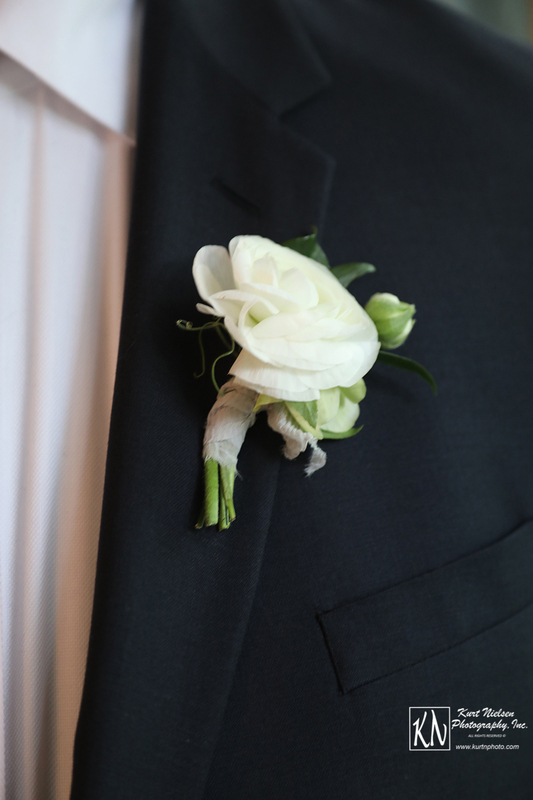 It is basically a pre-nup that the groom signs and protects the bride. 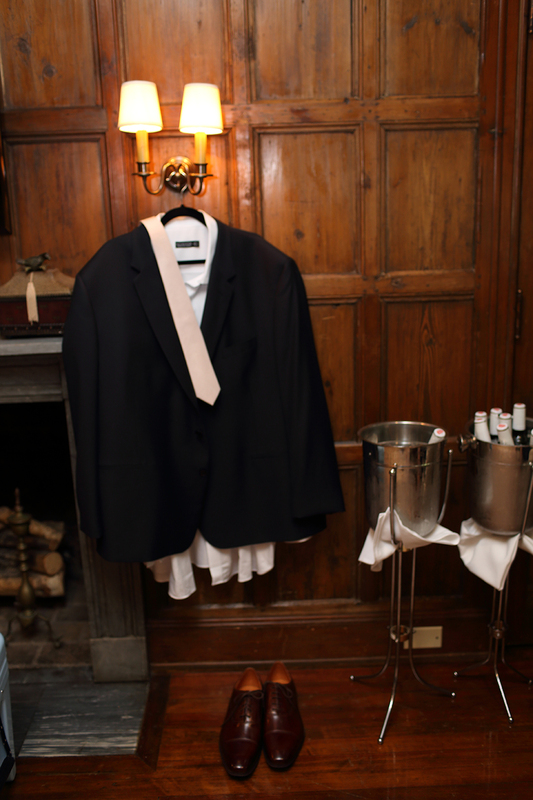 Although in today’s times it doesn’t usually have any monetary value today. 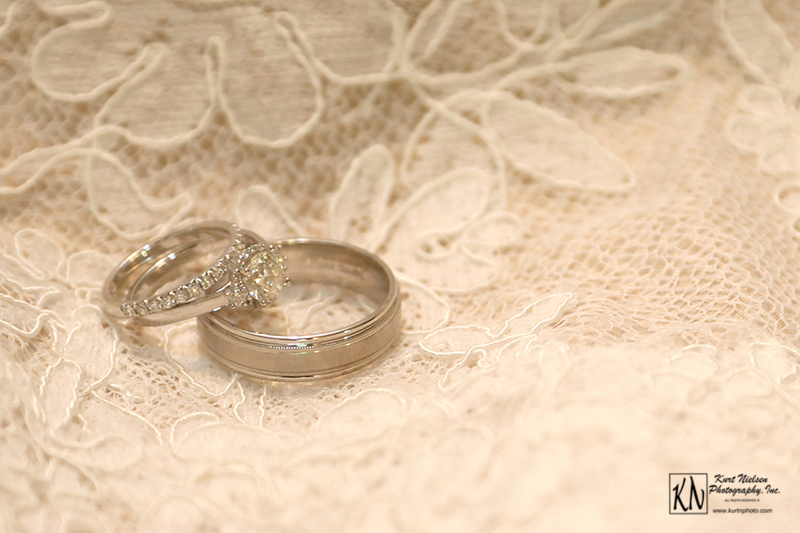 However, in biblical times, it was the price the groom paid to marry his bride. 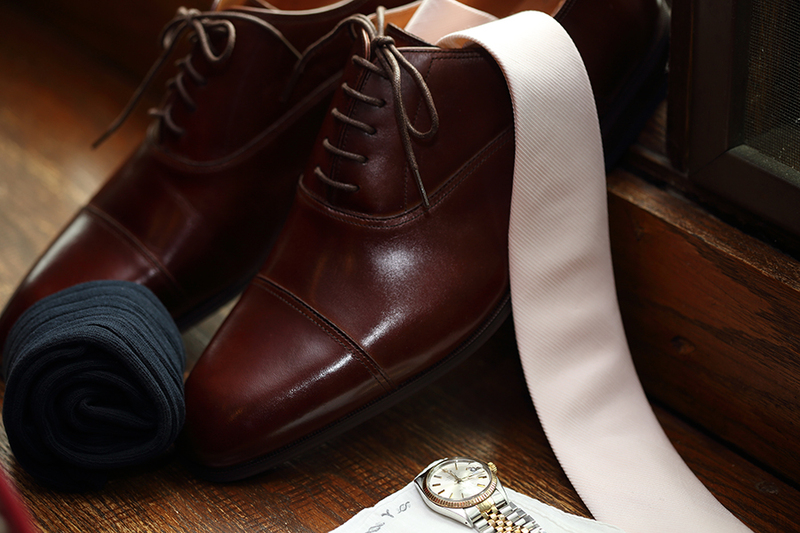 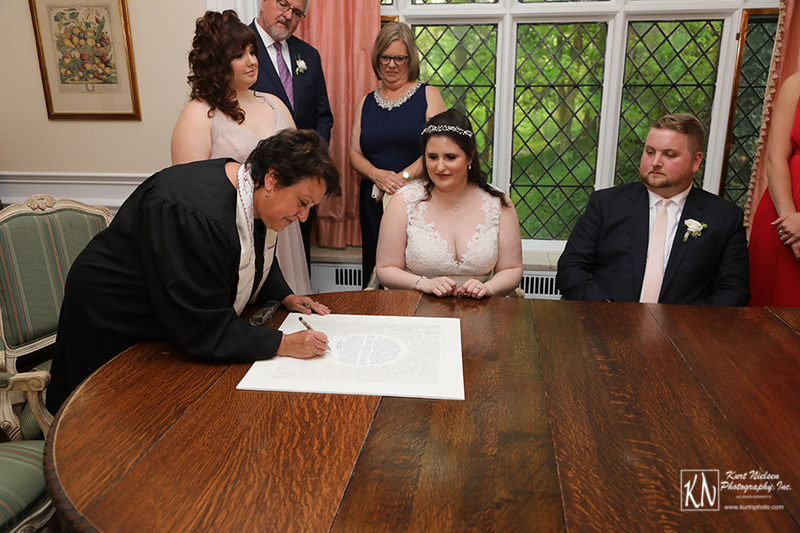 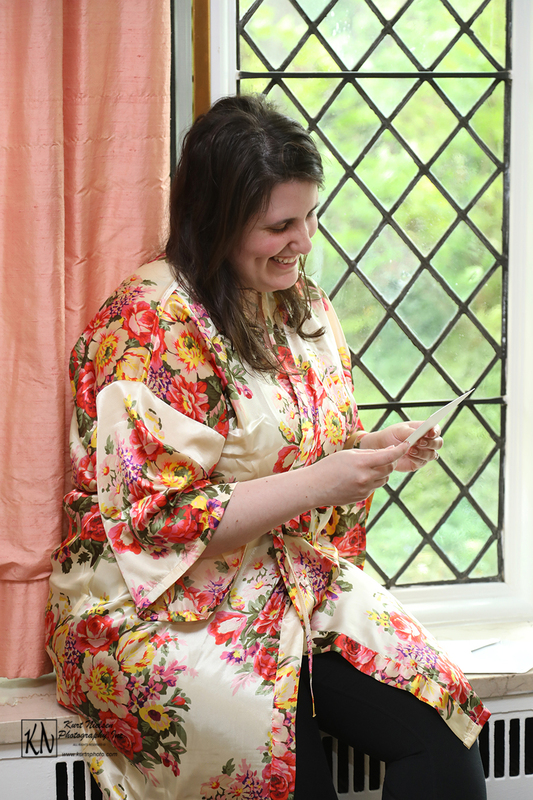 By signing the Ketubah, the groom agreed to pay the bride or her parents an agreed amount of money or other items. 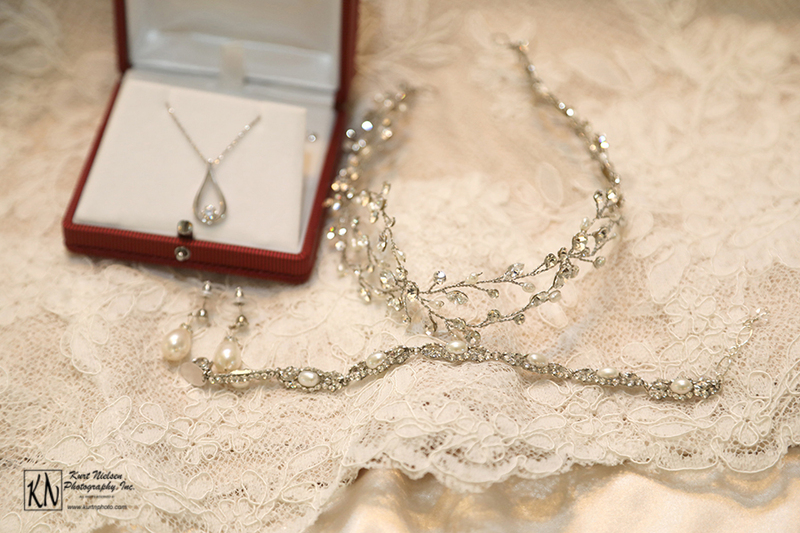 It also specified that the groom continues supporting her should the marriage end either by death or divorce. 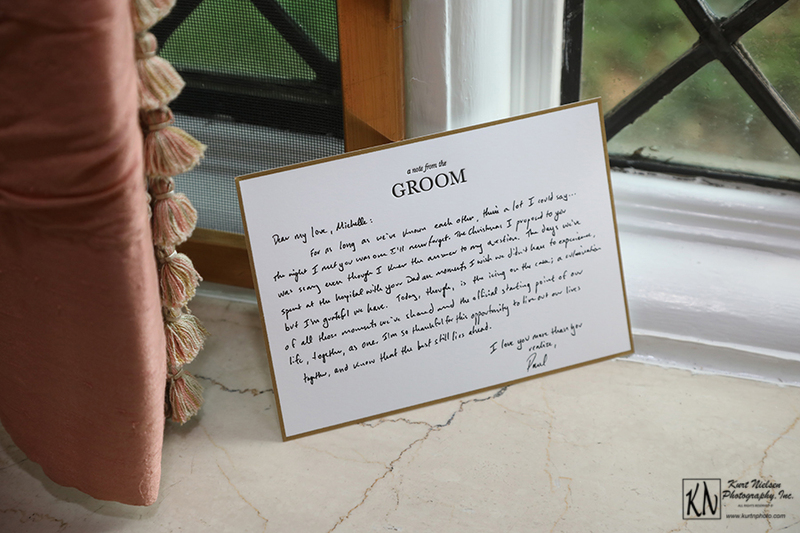 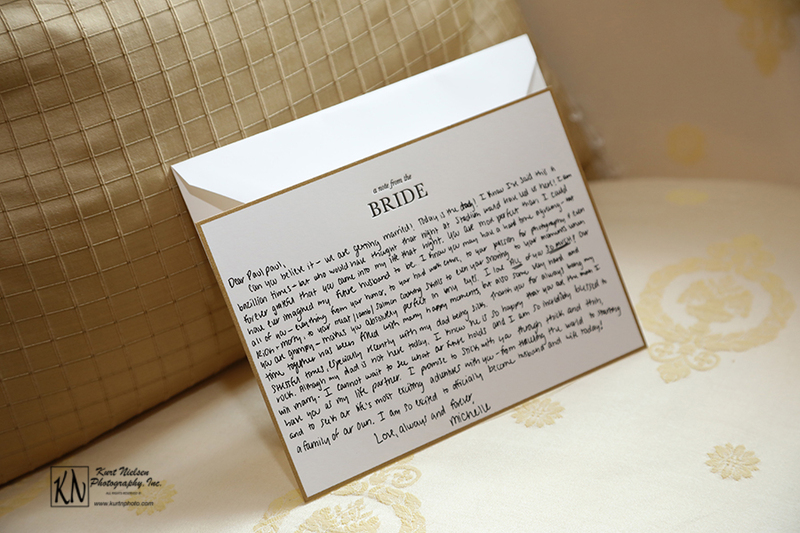 Today, it often times serves as a reminder of the couple’s vows and responsibilities as it hangs in their home. 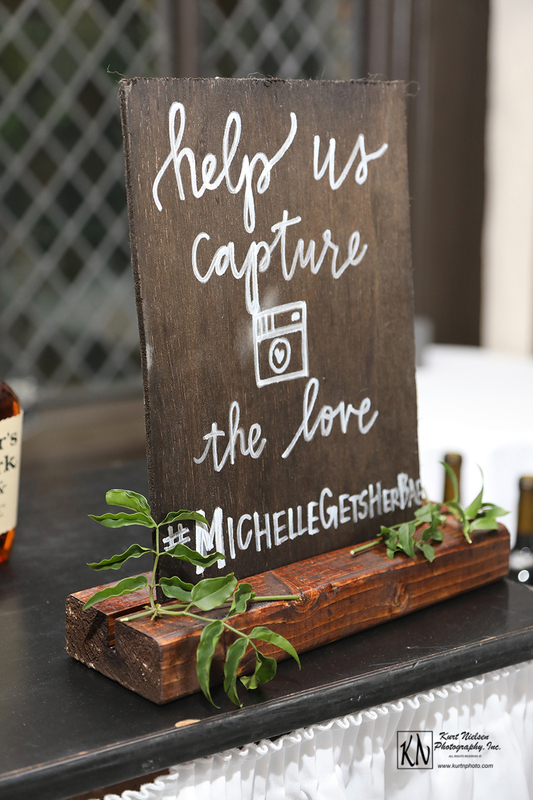 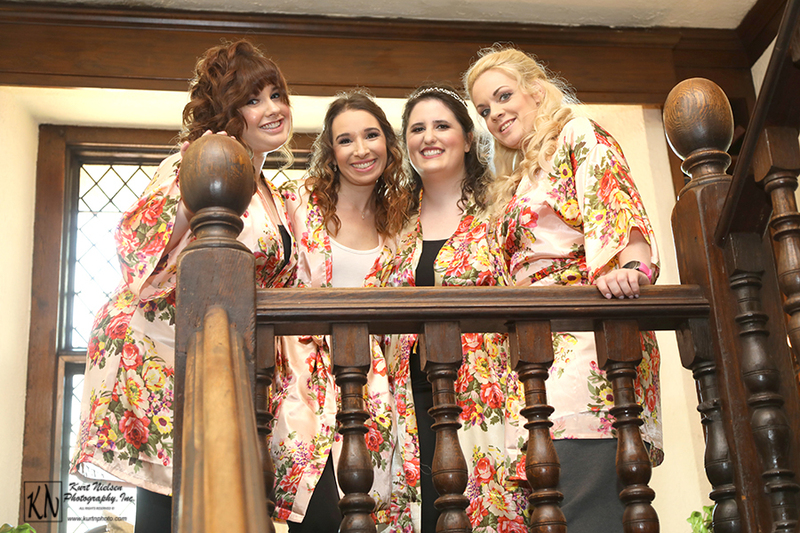 Michelle’s Jewish heritage also played a big part in their wedding ceremony. 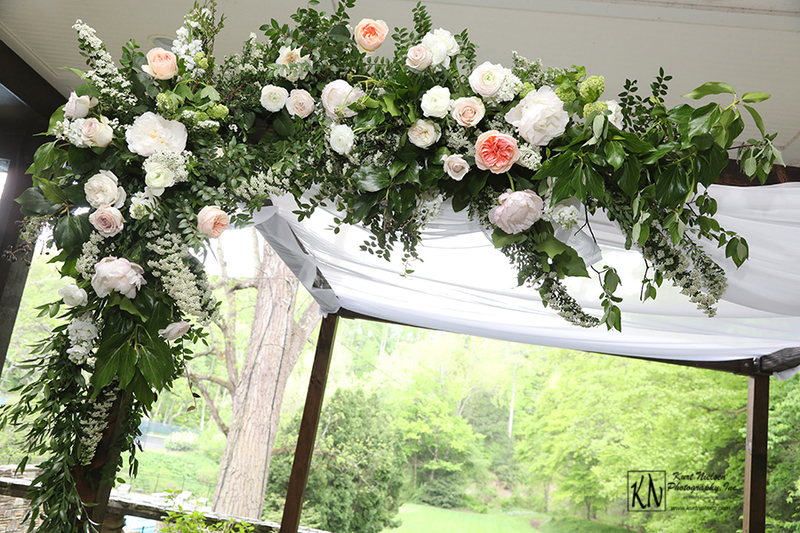 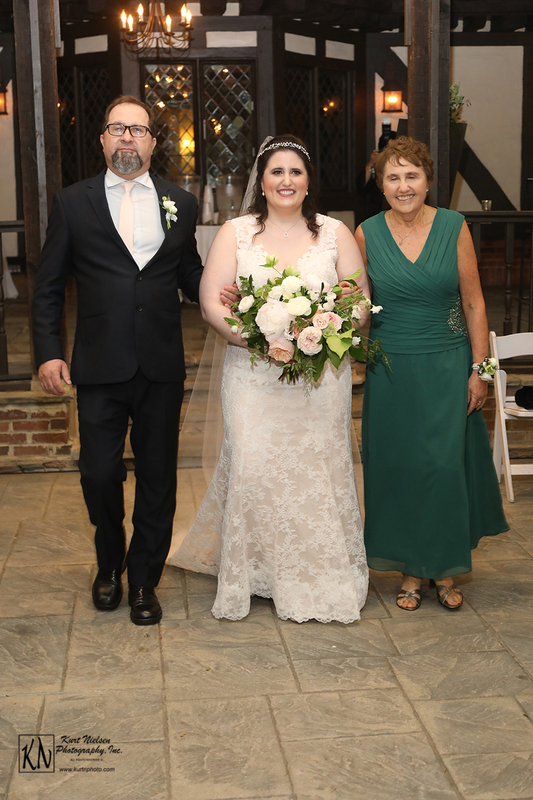 Molly Taylor and Co. did an amazing job designing and building the Chuppah under which the couple was married. 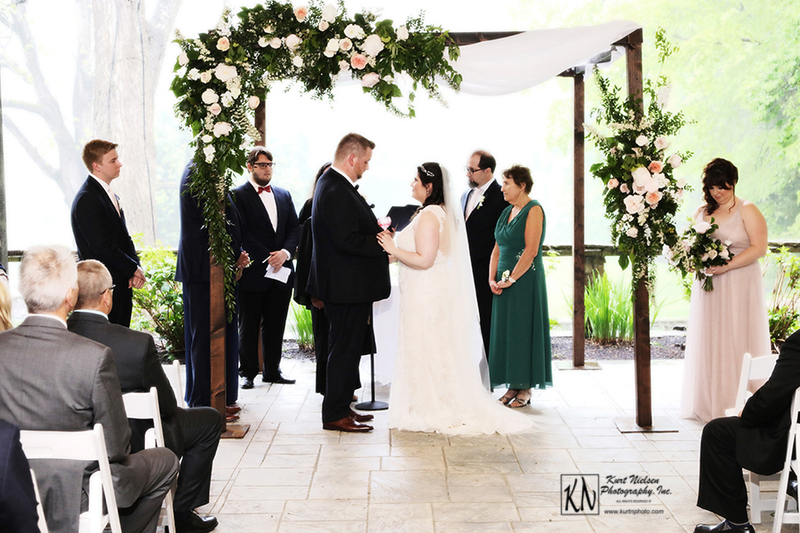 Cantor Laurel Barr performed the interfaith ceremony. 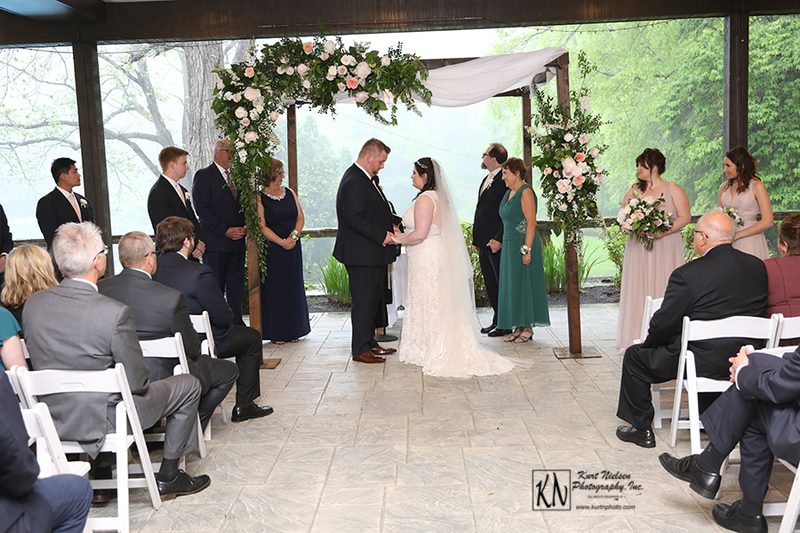 They say rain on your wedding day is good luck. 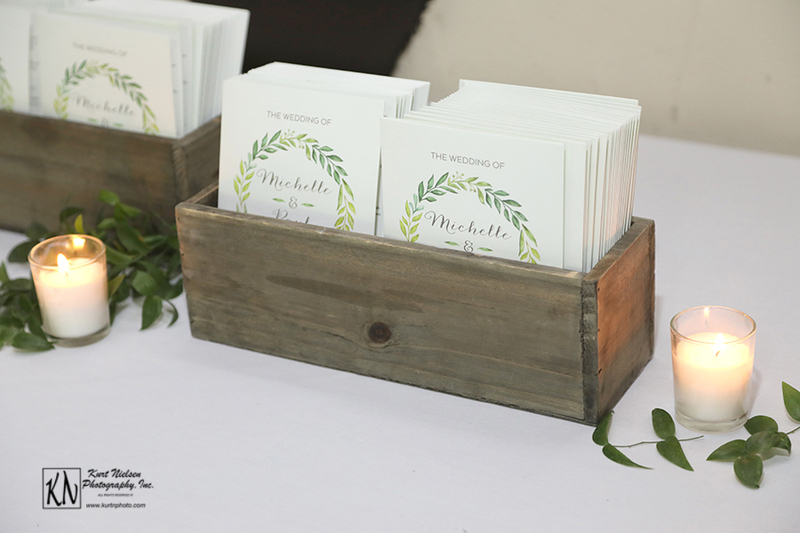 Cantor Barr stated Michelle and Paul will have an abundance of good luck since it poured buckets during their ceremony! 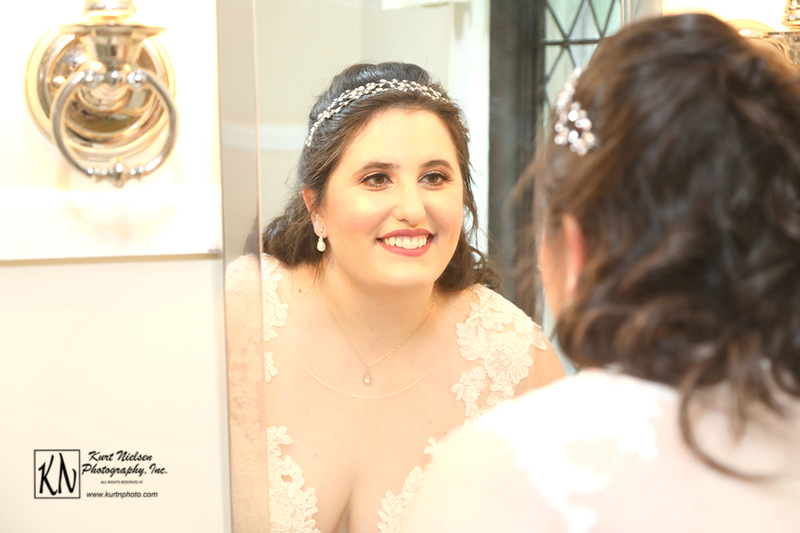 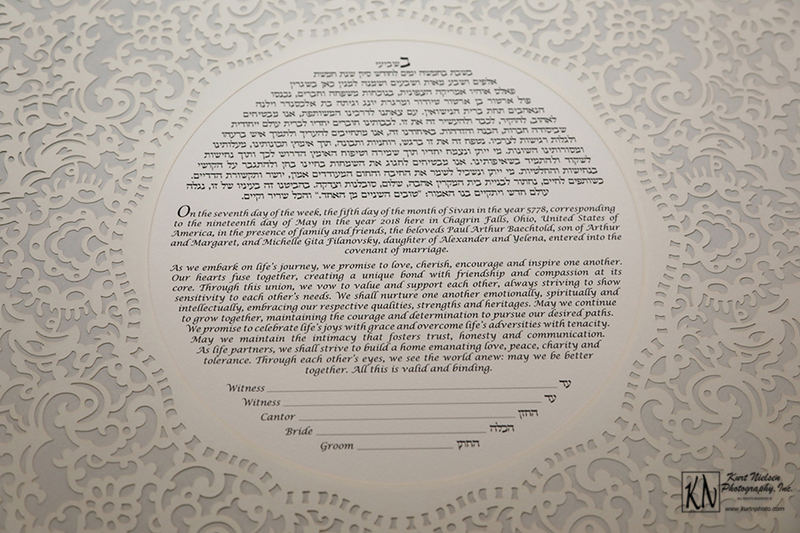 The Ketubah was read during the ceremony to publically affirmed the groom’s obligations to the bride. 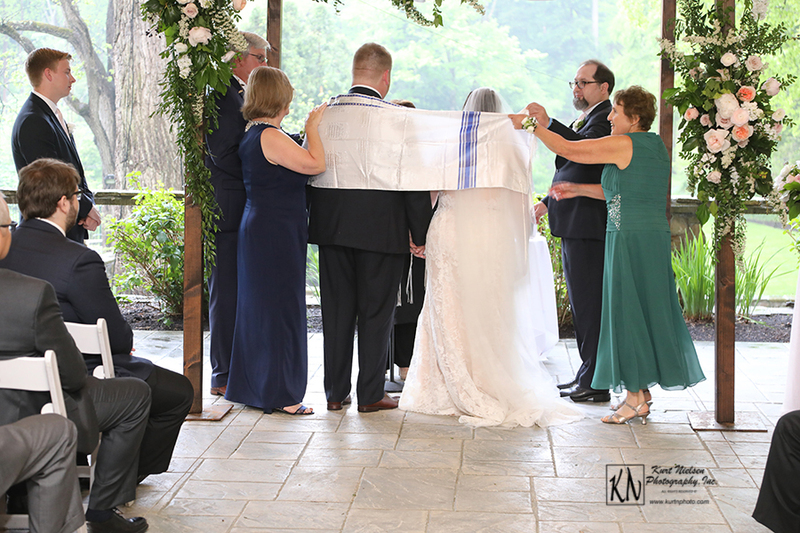 The couple also included the Kiddush (blessing over the wine) and the Sheva Brachot (7 blessings) during the ceremony. 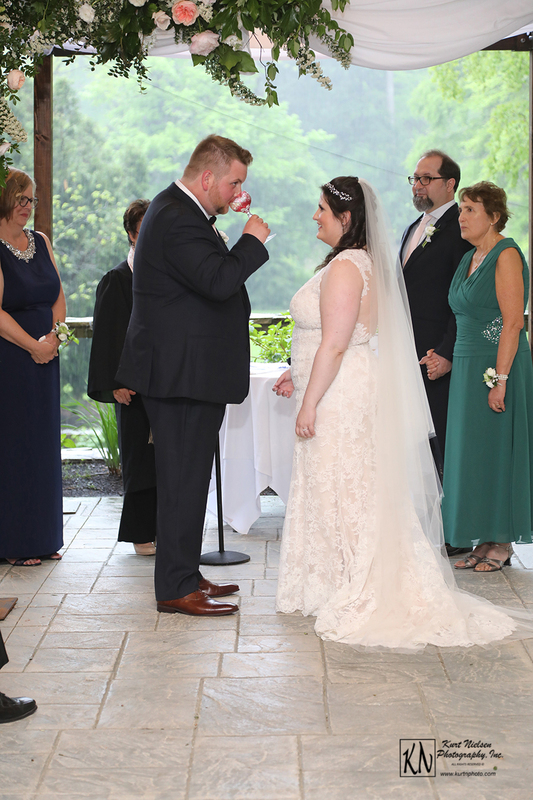 Of course, no Jewish wedding would be complete without the breaking of the glass before the kiss! 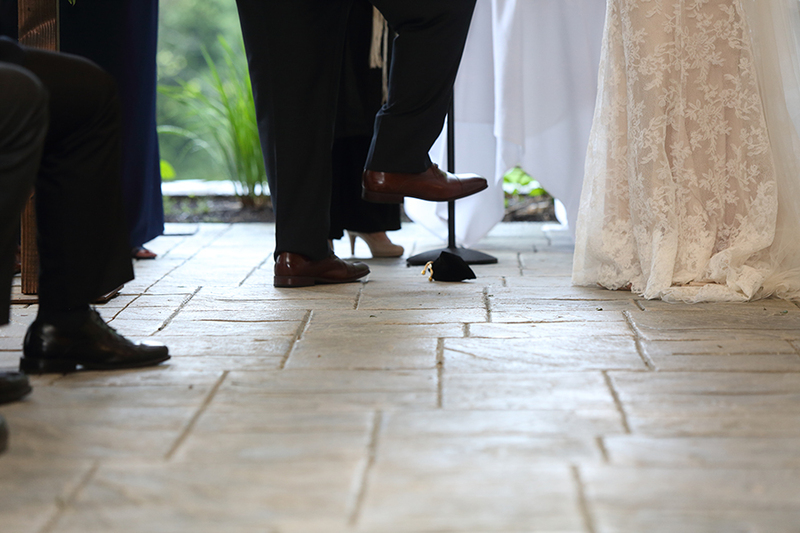 The heavens must have approved because as soon as the guests shouted “Mazel Tov,” there was a loud boom of thunder! 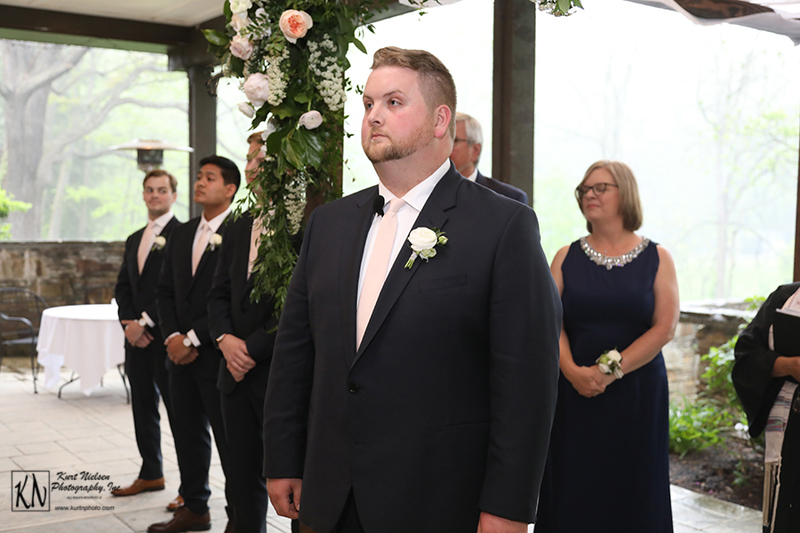 Although everything about Michelle and Paul’s wedding day was absolutely perfect, there was one person who was visibly missing. 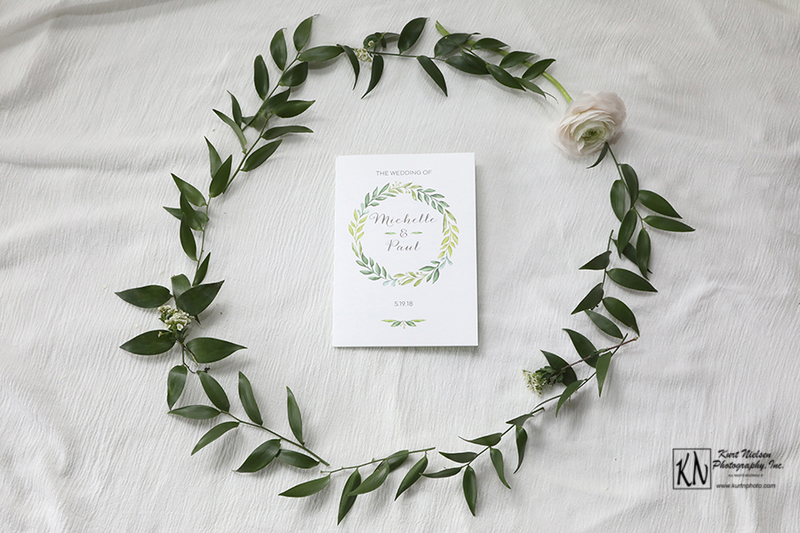 Michelle’s dad was back in Toledo in a hospital recovering from emergency surgery and obviously couldn’t be there physically. 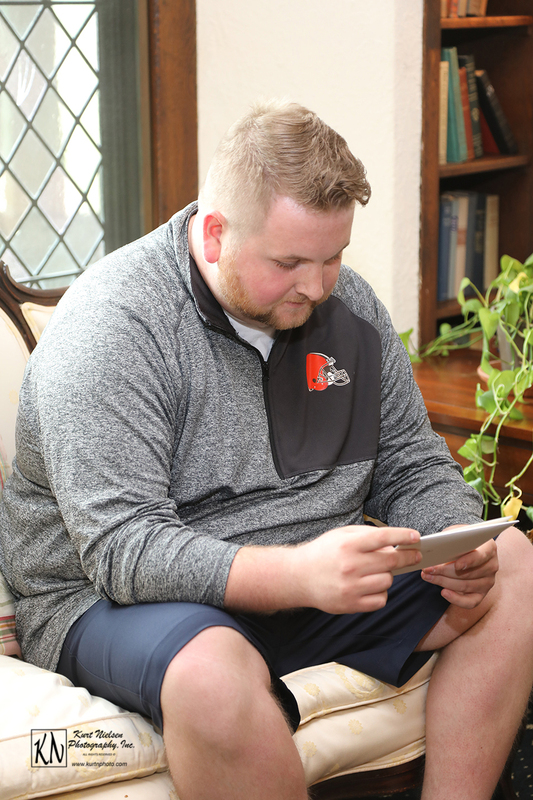 However, with the help of modern technology, he didn’t miss a thing. 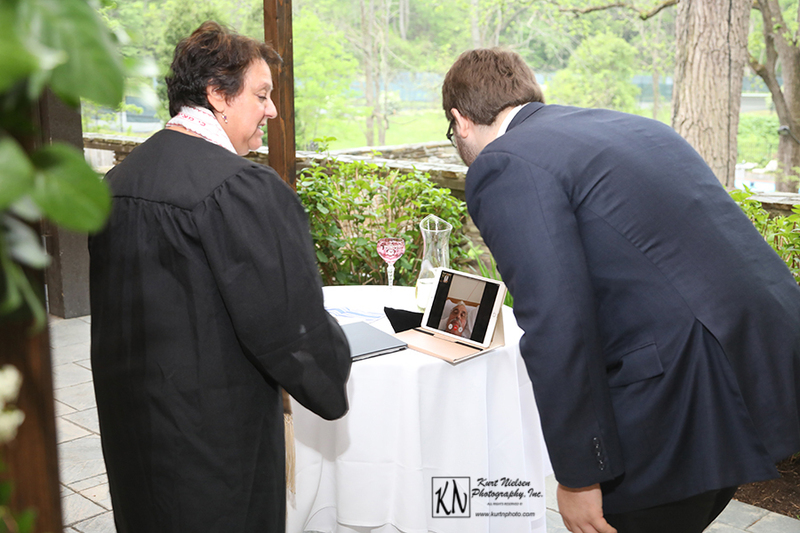 Michelle’s nephew managed to set up a video chat feed on an iPad placed on the table under the Chuppah so Michelle’s dad didn’t miss a moment of the ceremony. 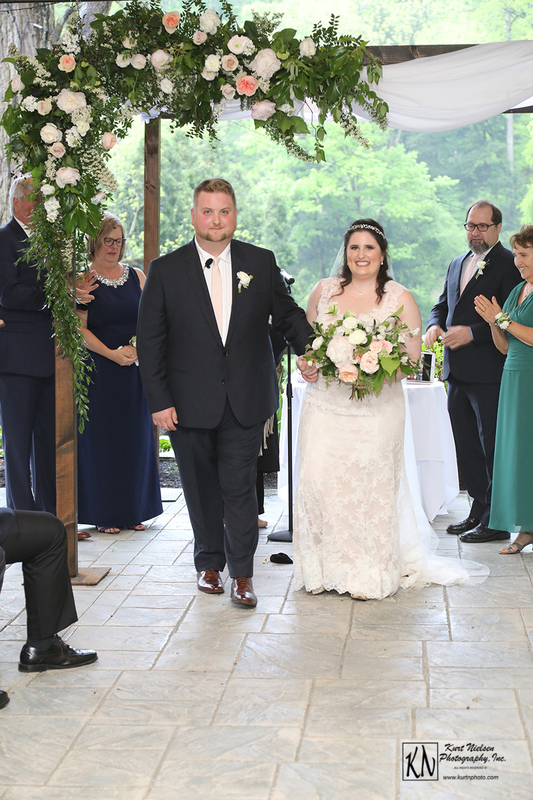 Her brother and mother walked her down the aisle in his place. 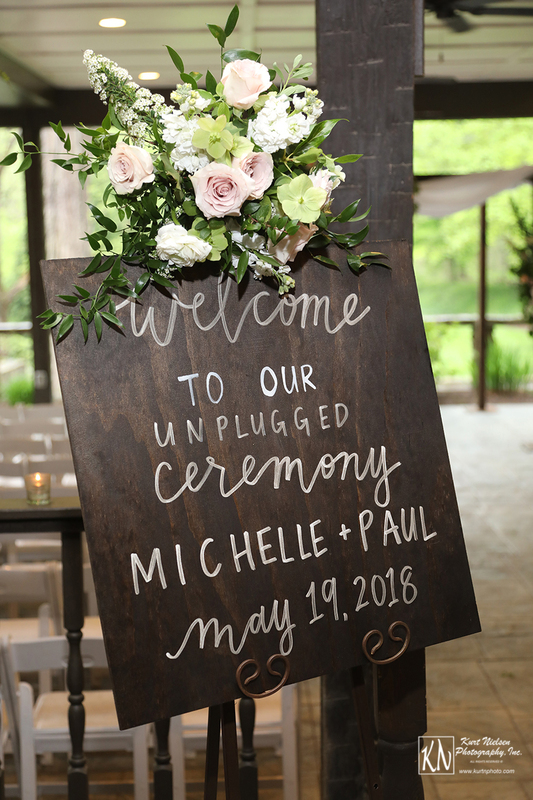 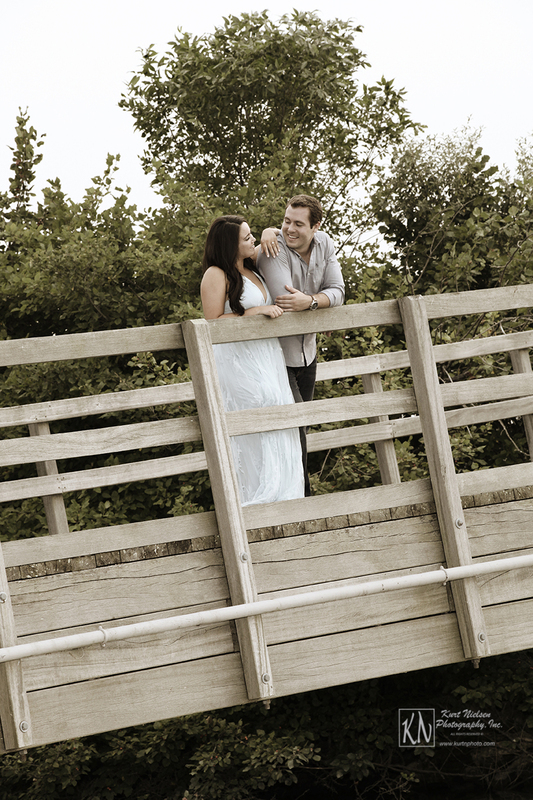 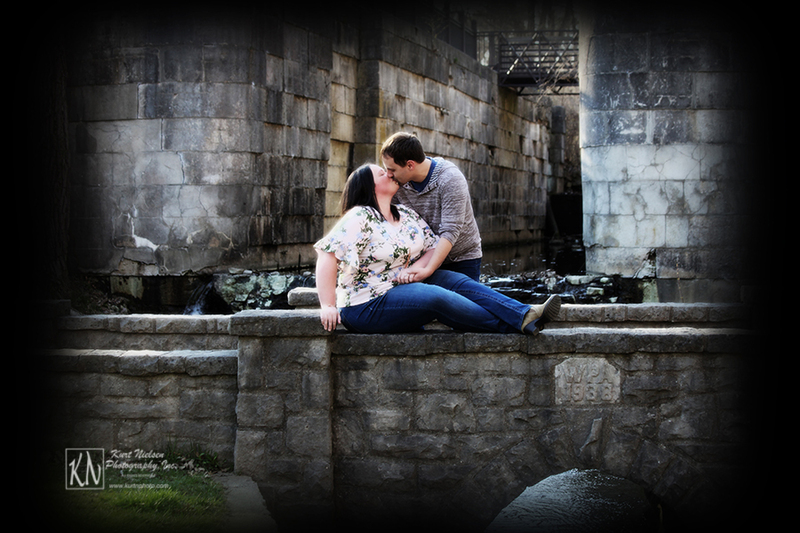 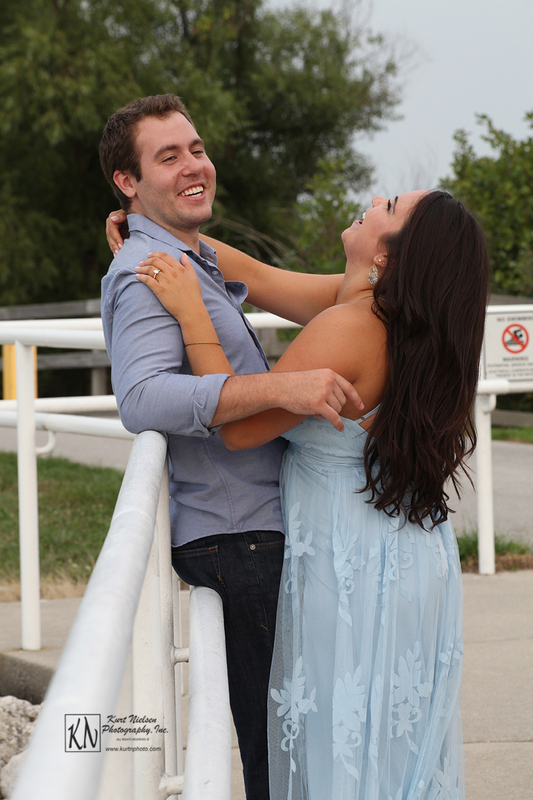 Michelle and Paul’s busy schedules left little time for wedding planning. 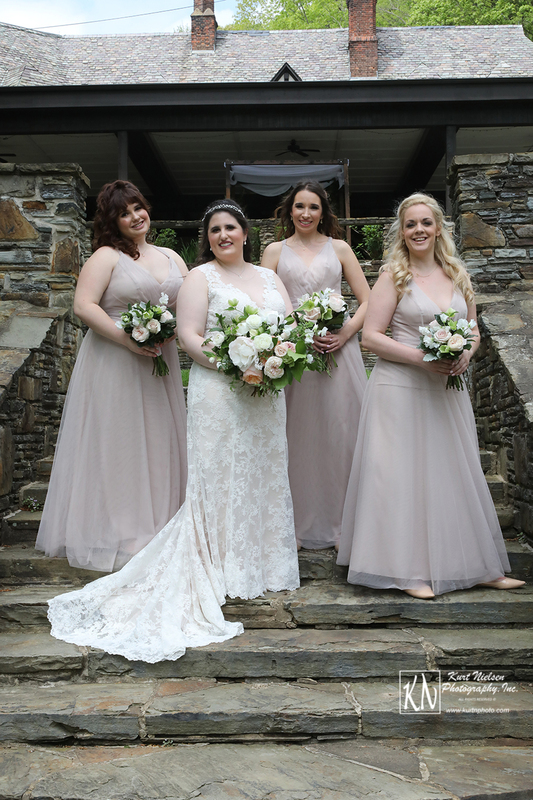 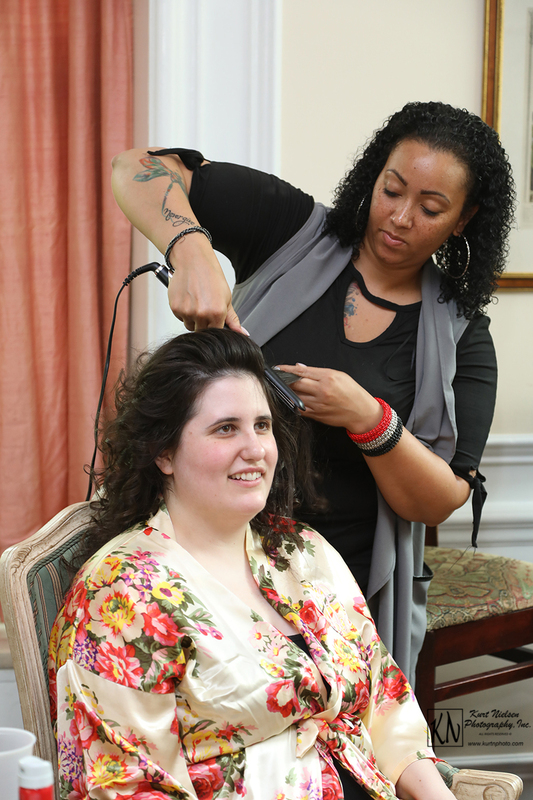 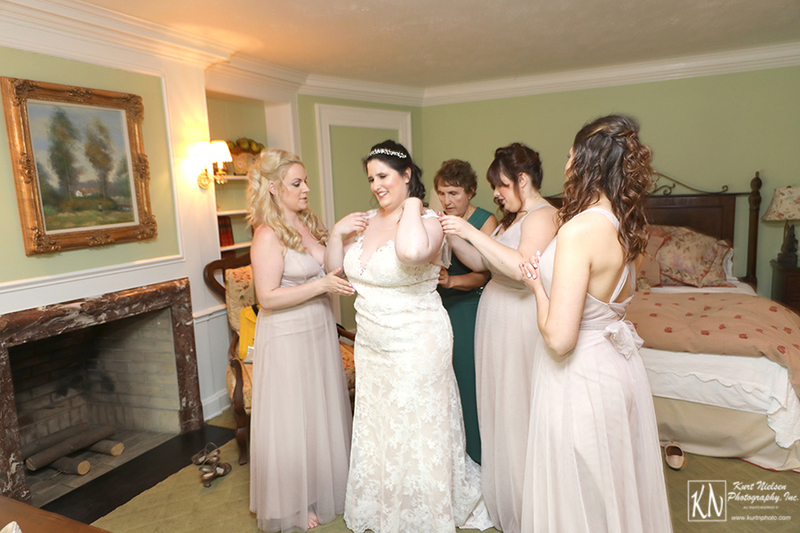 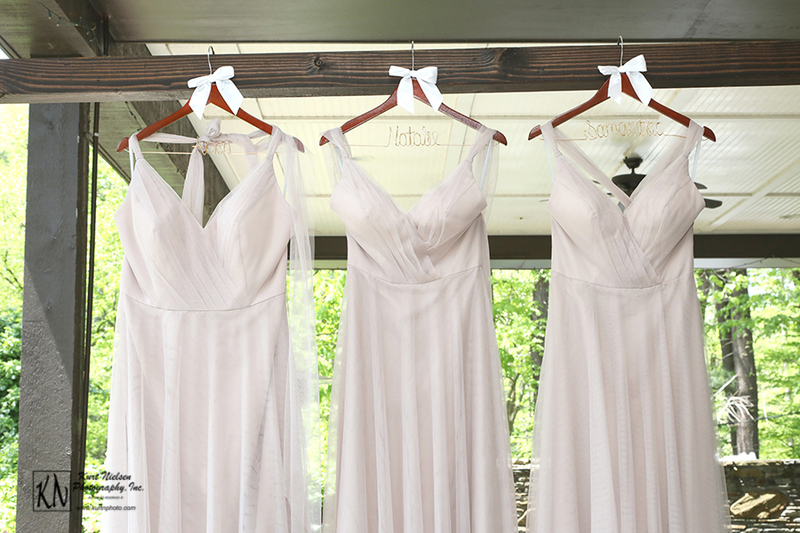 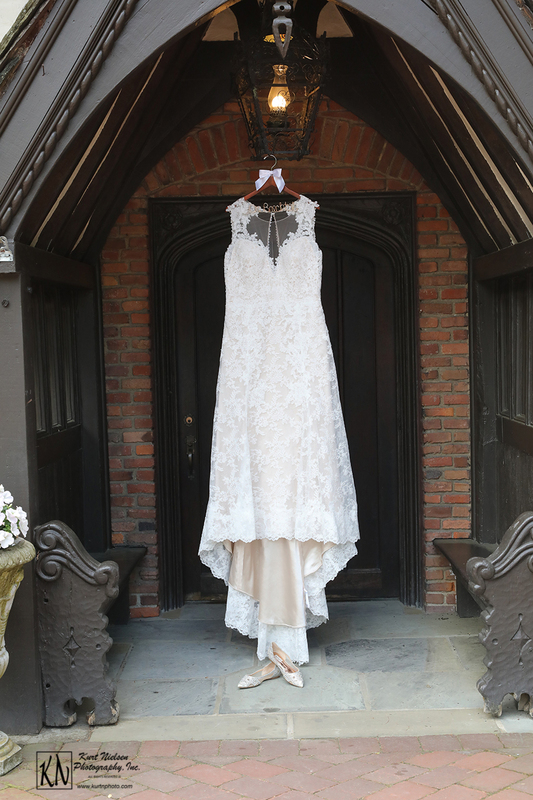 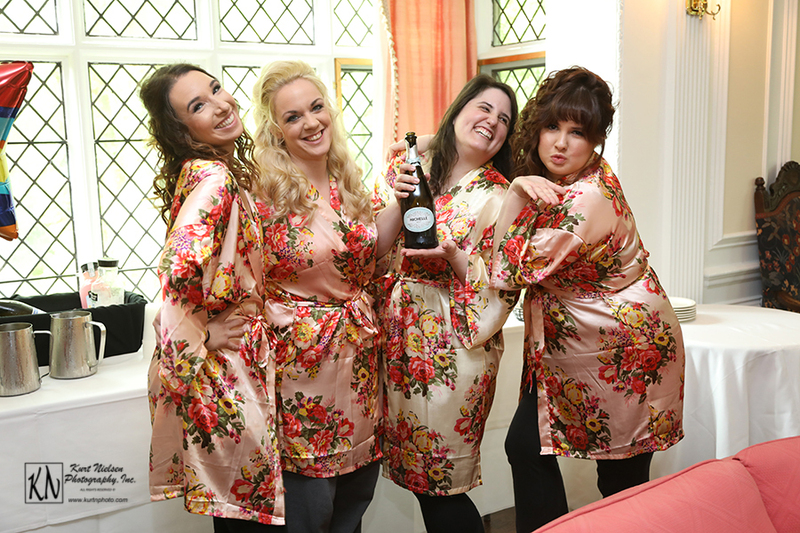 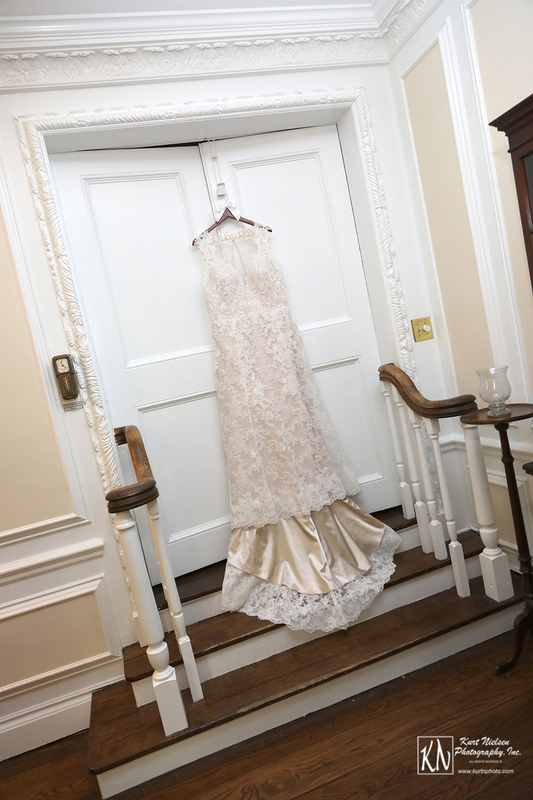 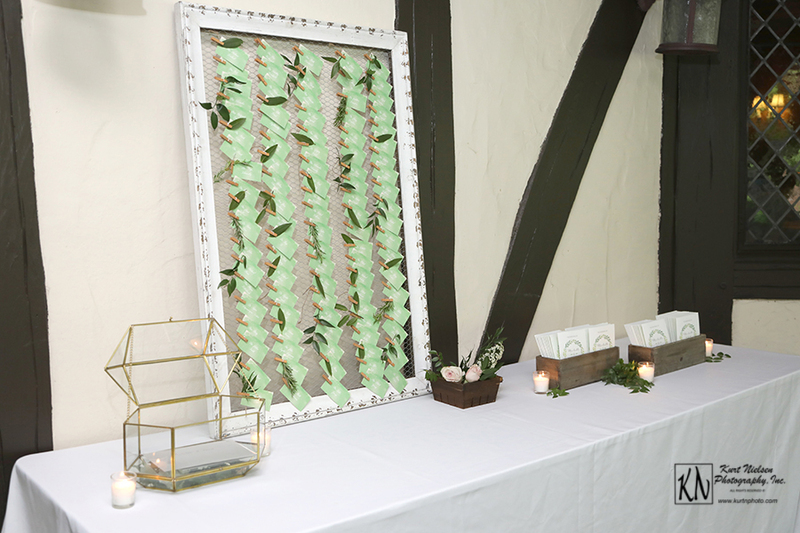 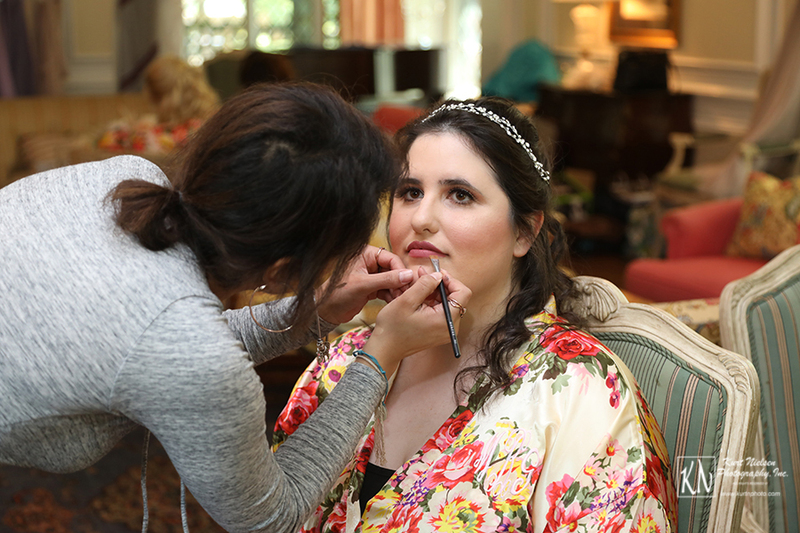 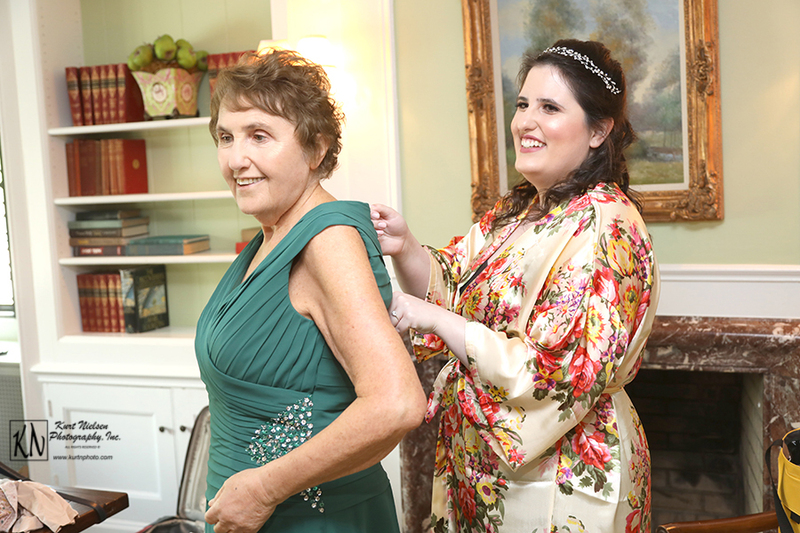 Therefore, they enlisted the help of Lauren Hibbard from A Charming Fete to help them create their dream wedding. 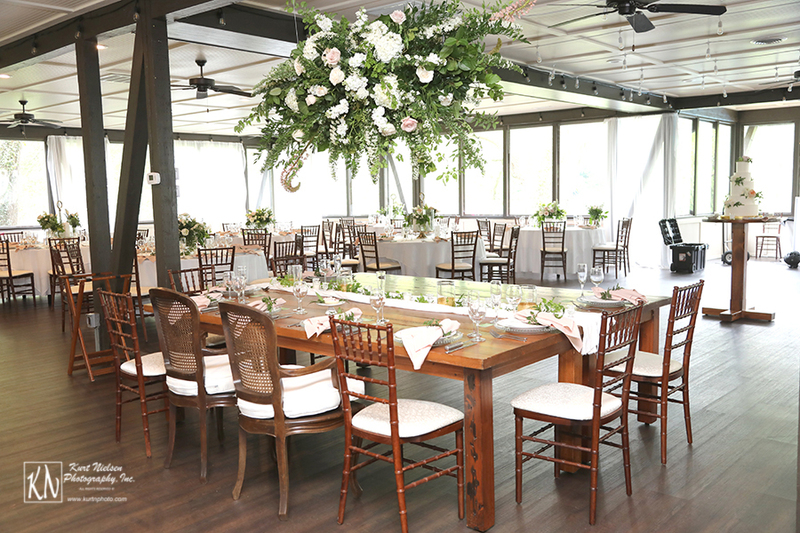 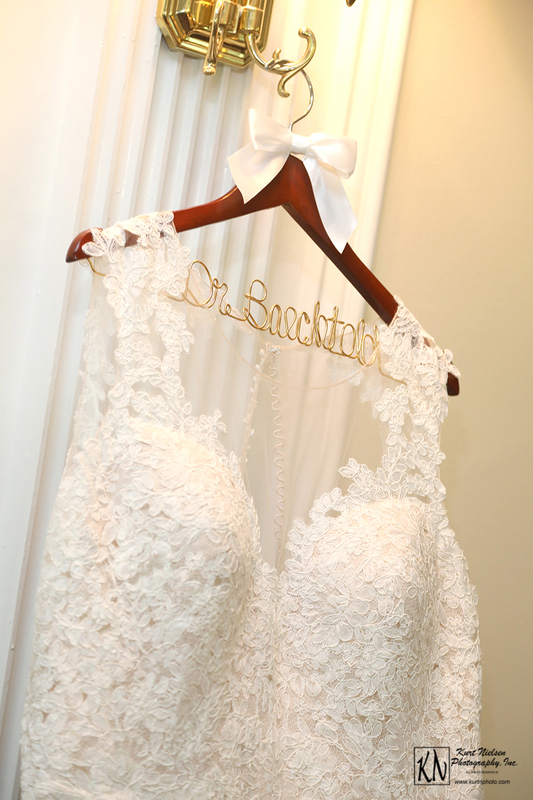 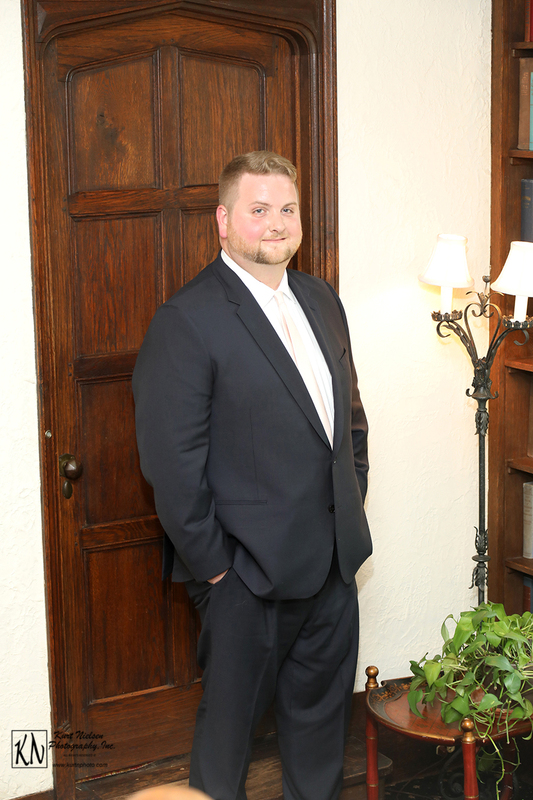 It was instantly clear why they are one of the top wedding planning companies in the country! 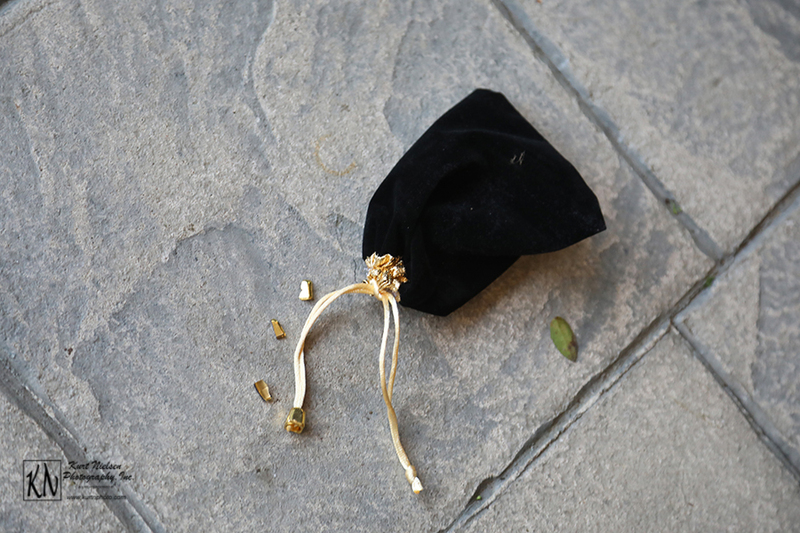 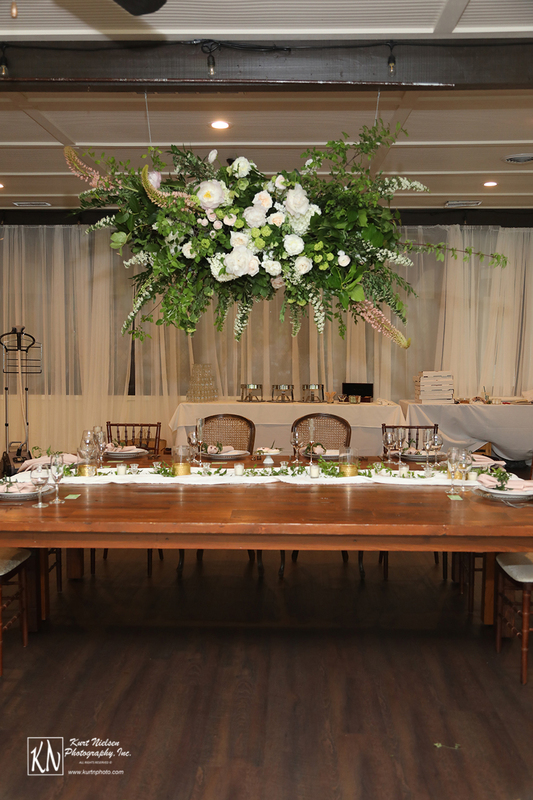 They wanted everything to look and feel very natural yet elegant. 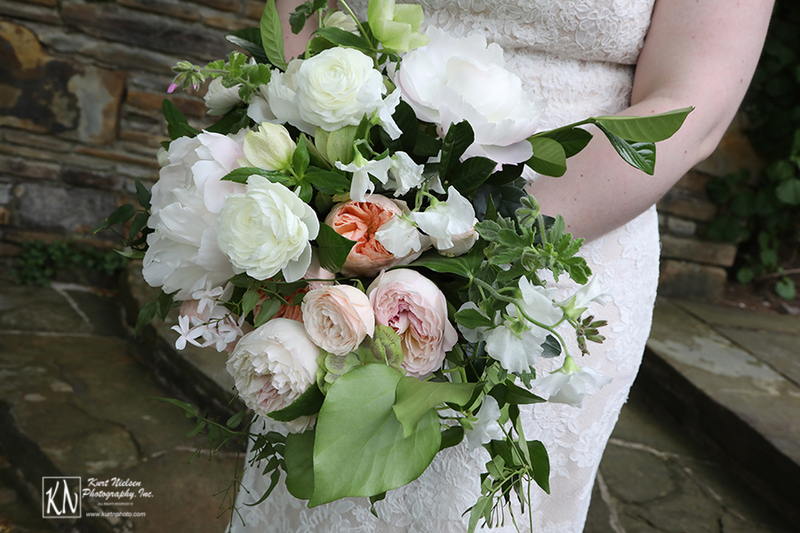 Michelle loves the look of freshly picked flowers and wanted the floral aspects to look as if they were freshly picked from the garden. 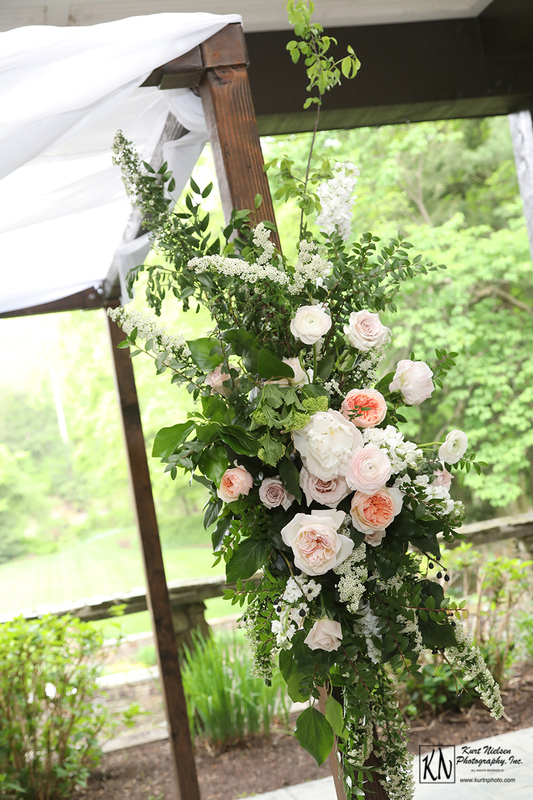 This included leaving the leaves on the stems of the flowers. 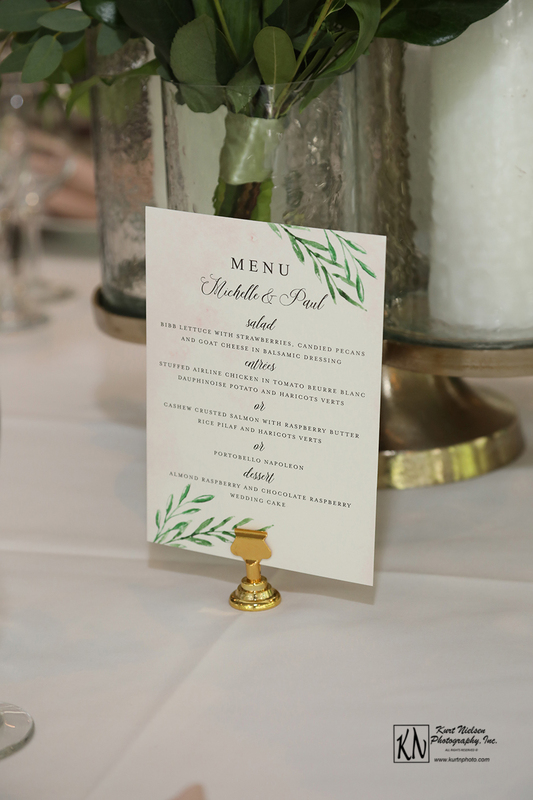 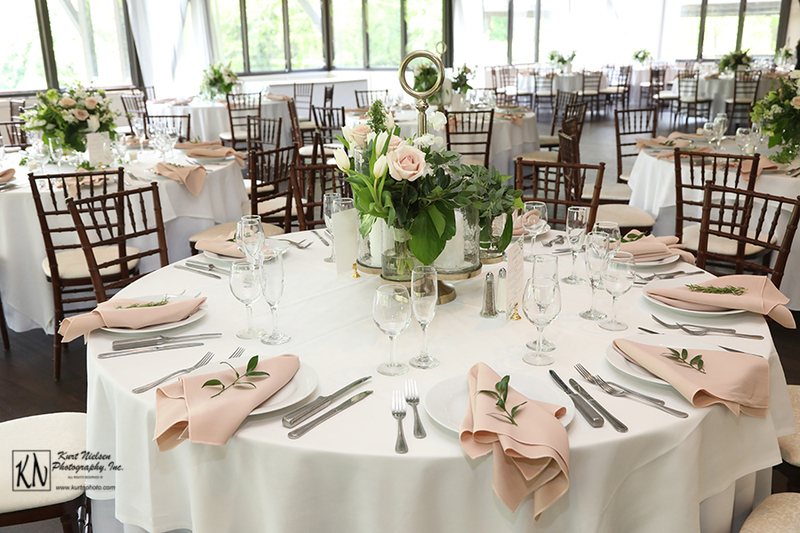 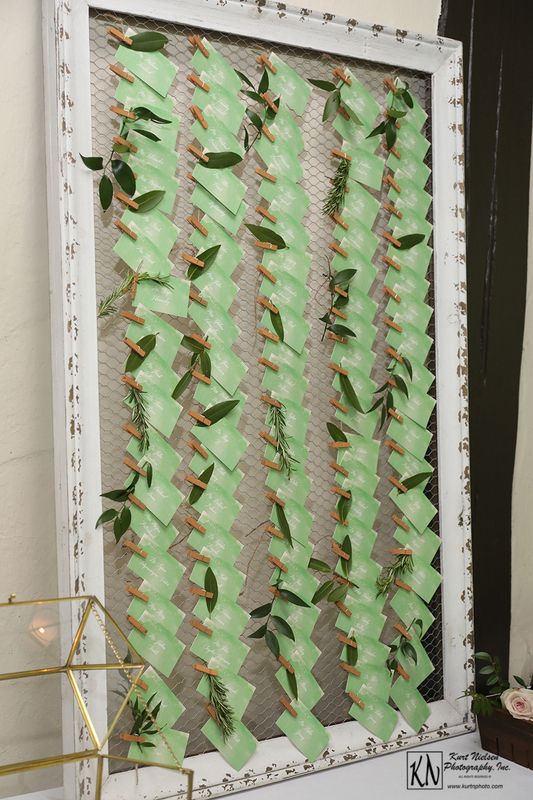 Their color scheme of blush, champagne gold, and leafy green was modishly displayed throughout the venue. 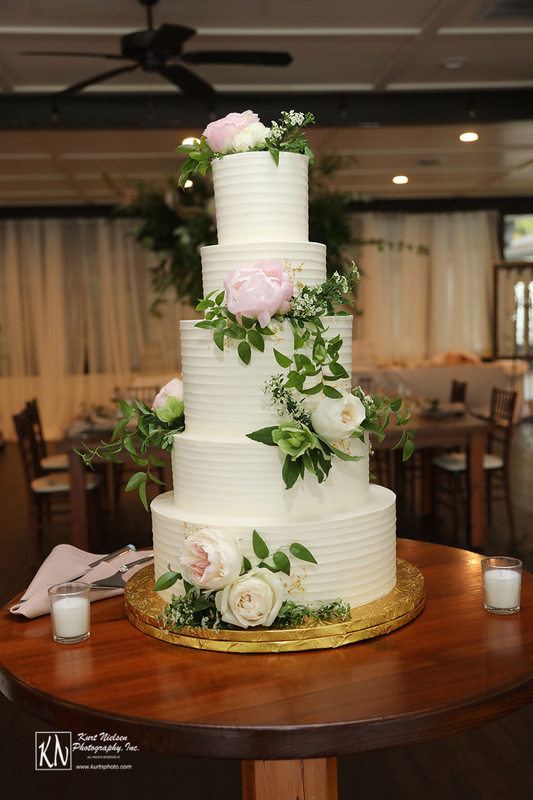 The minimal gold flakes on the wedding cake from Luna Bakery & Café perfectly demonstrated the graceful style the couple wanted. 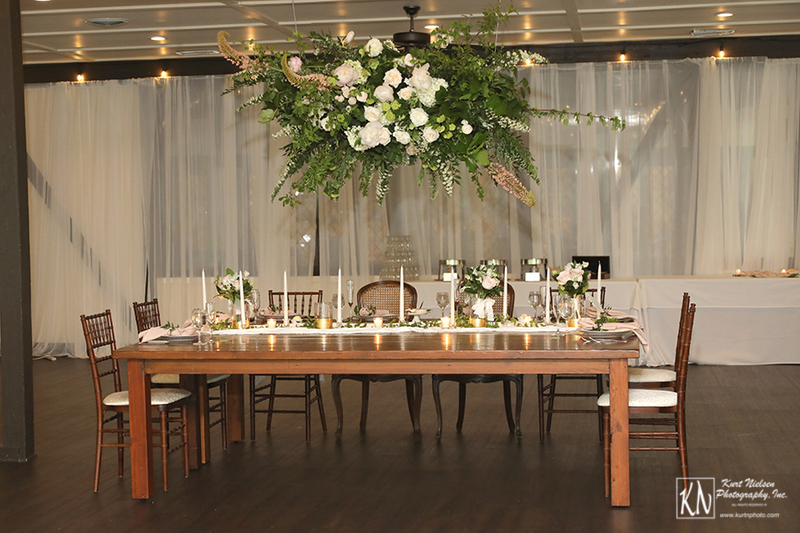 The white tablecloths gave a simple and airy feel to the room. 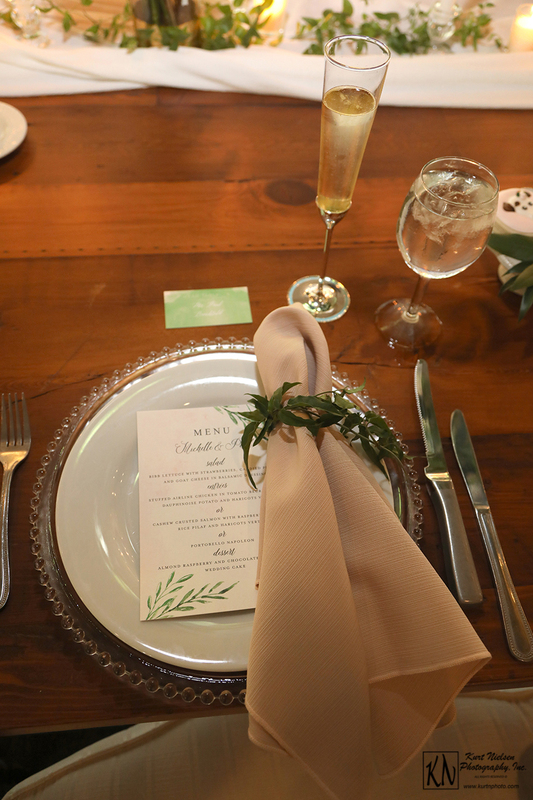 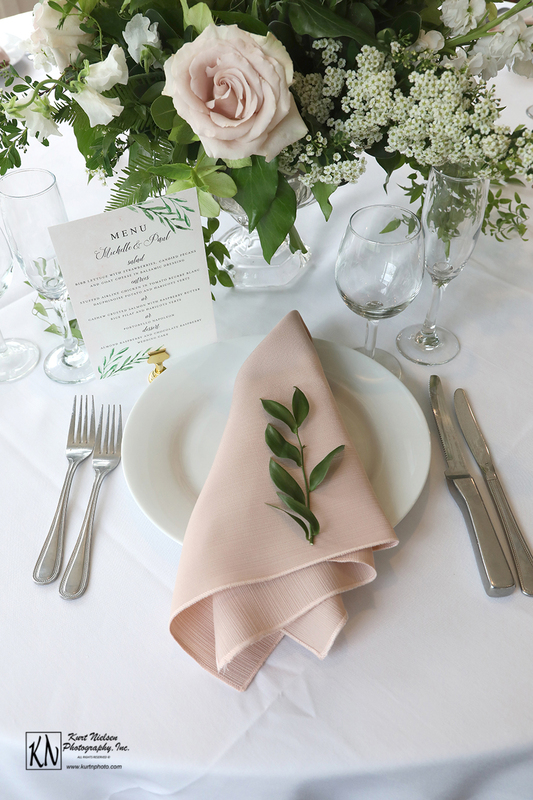 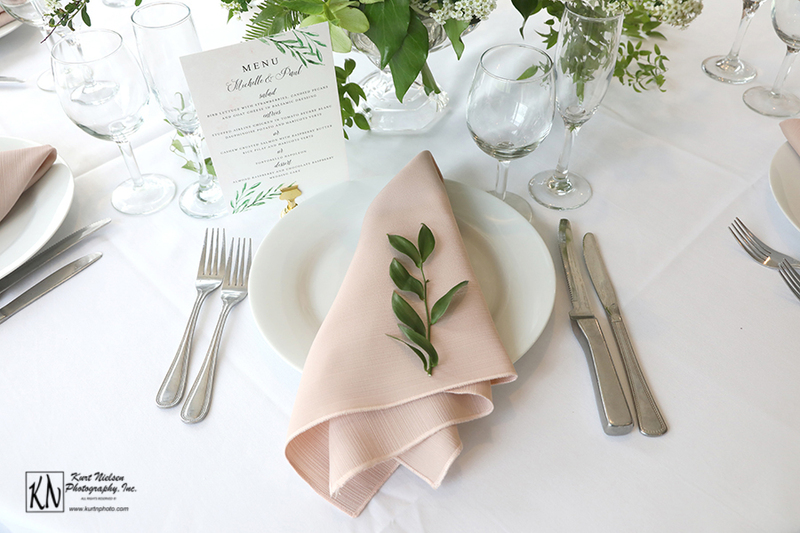 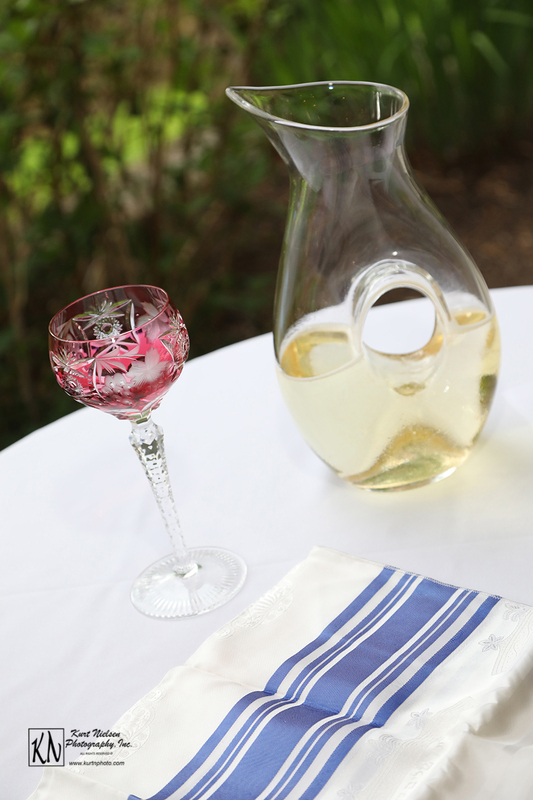 The blush napkins were enhanced with sprigs of vines at each table setting. 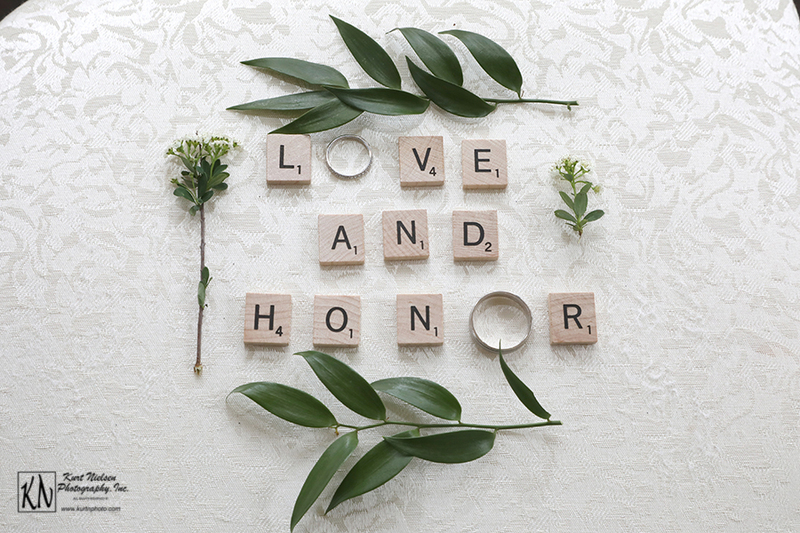 The stationery from Minted.com also reflected this feel. 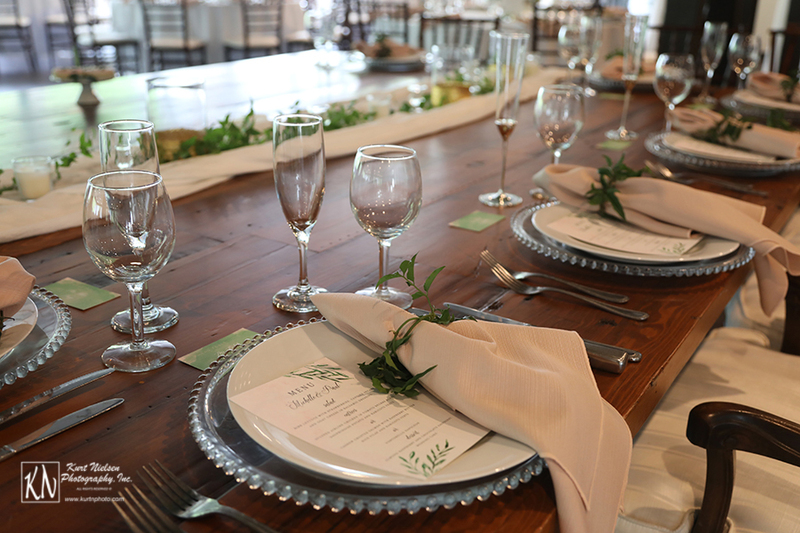 The farm table and cane back Betty chairs from Borrow Curated Rentals served as the head table and seating for the bride and groom. 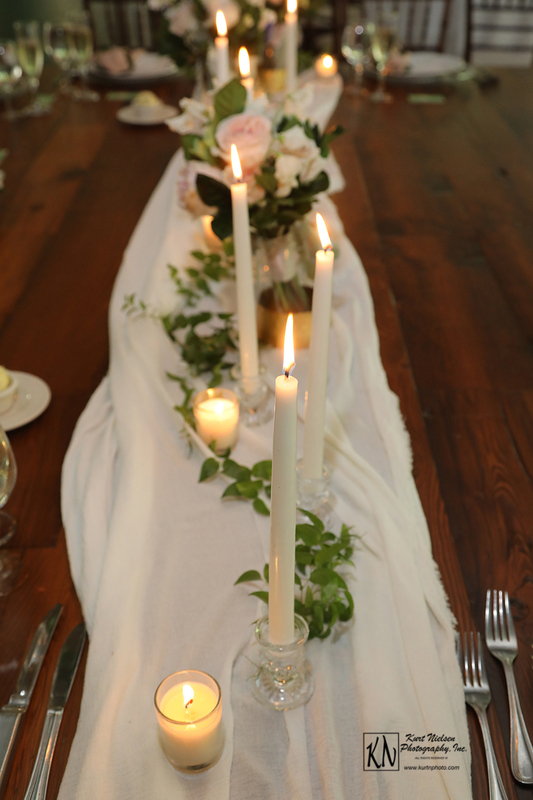 The head table was simply decorated with a white table runner adorned with a mix of white votive and tapered candles for a romantic feel. 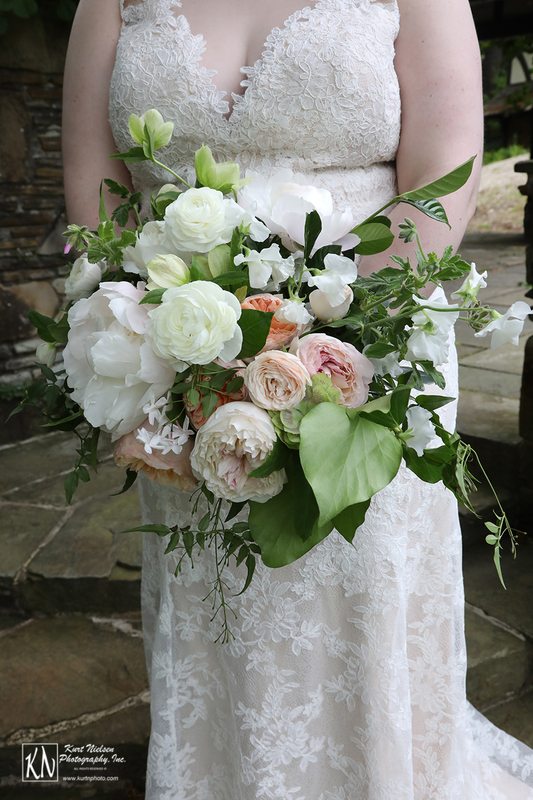 The bridal bouquets and greenery added to the romantic vibes. 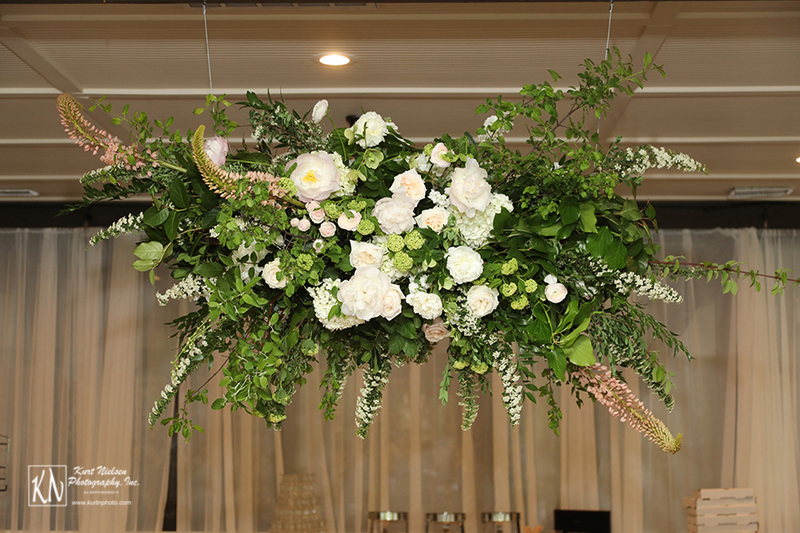 The hanging floral arrangement above the table was absolutely stunning. 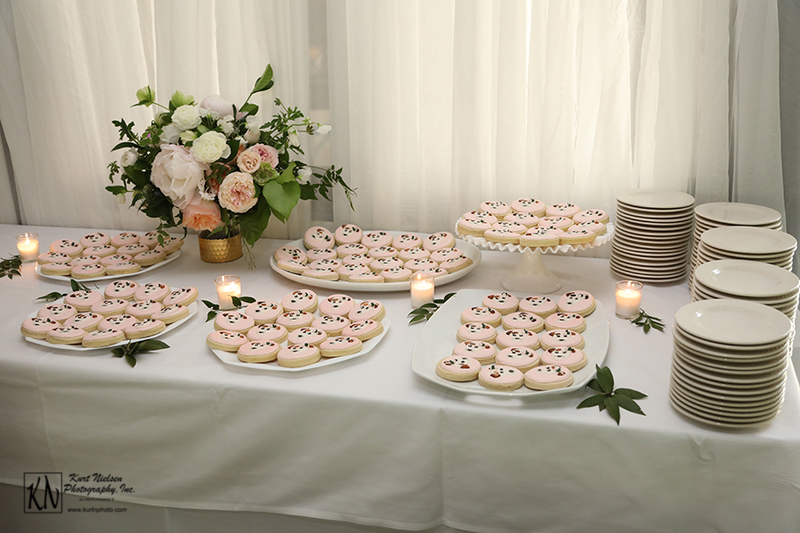 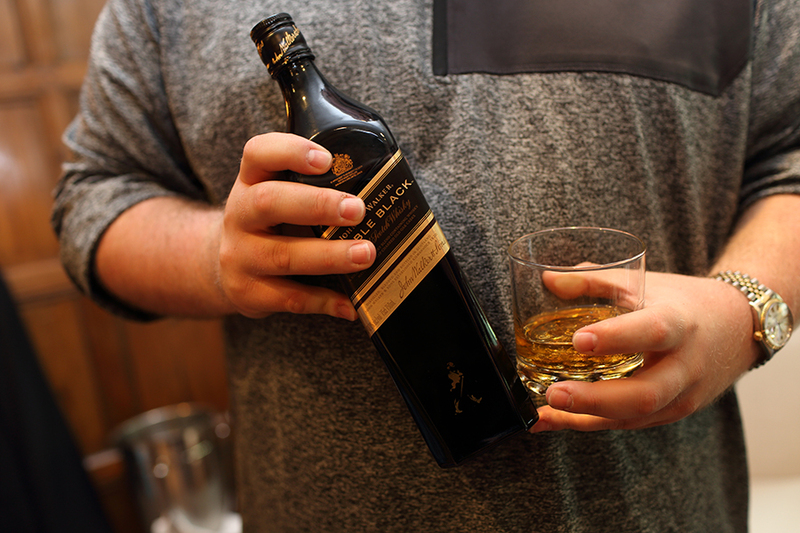 Another special family member made a decidedly unique appearance at the reception. 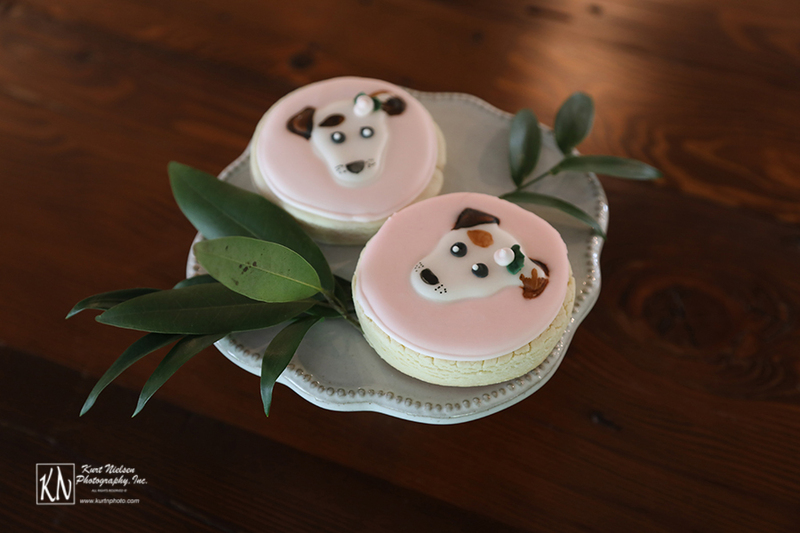 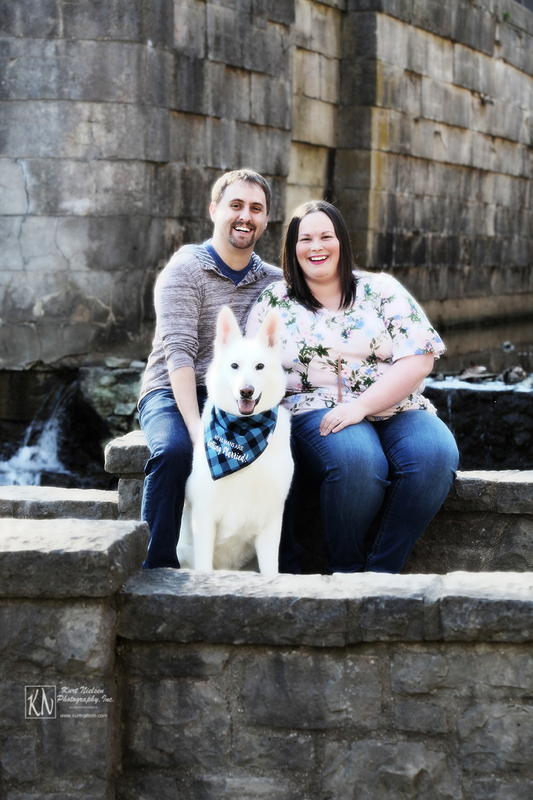 Paul and Michelle’s dog Luna was perfectly depicted on cookies created by Itty Bitty Bake Shop. 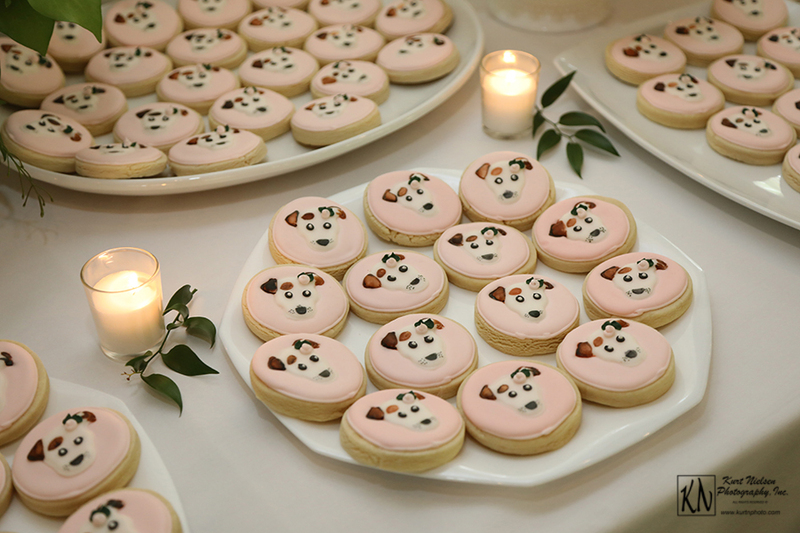 They were definitely a showstopper! 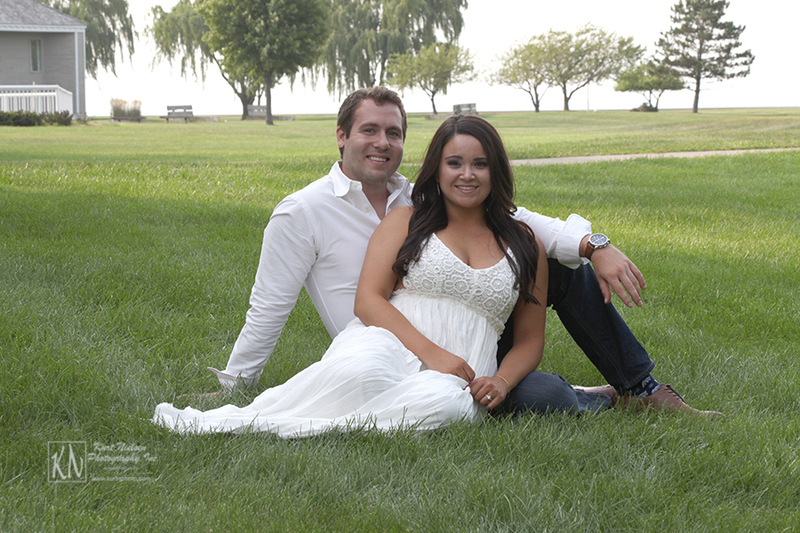 The happy couple met in college at Miami University in 2011 at a fraternity-sorority party that neither one really wanted to attend. 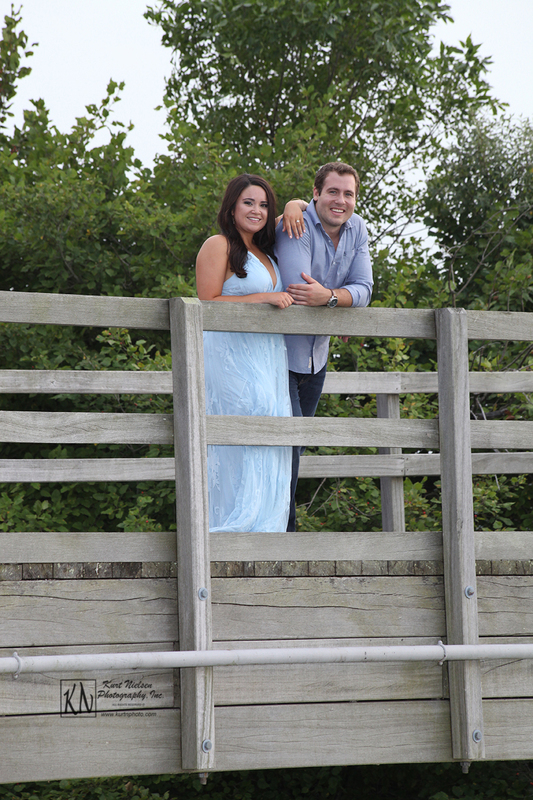 They have been inseparable ever since! 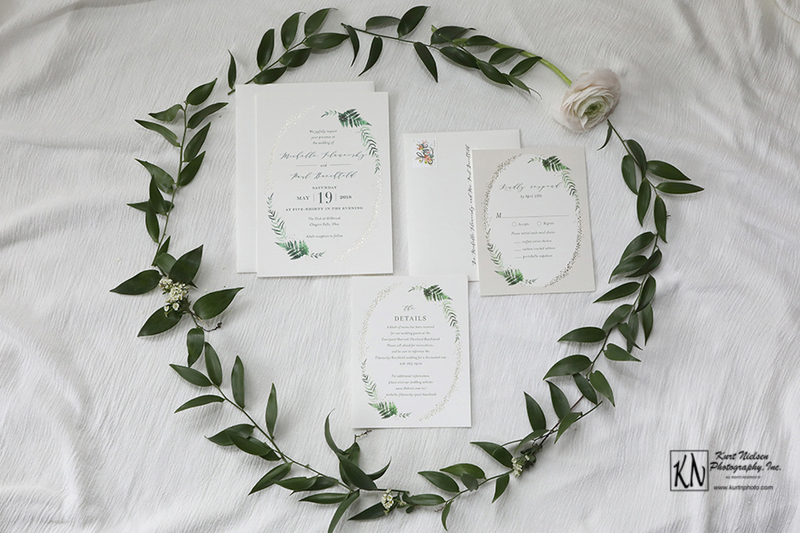 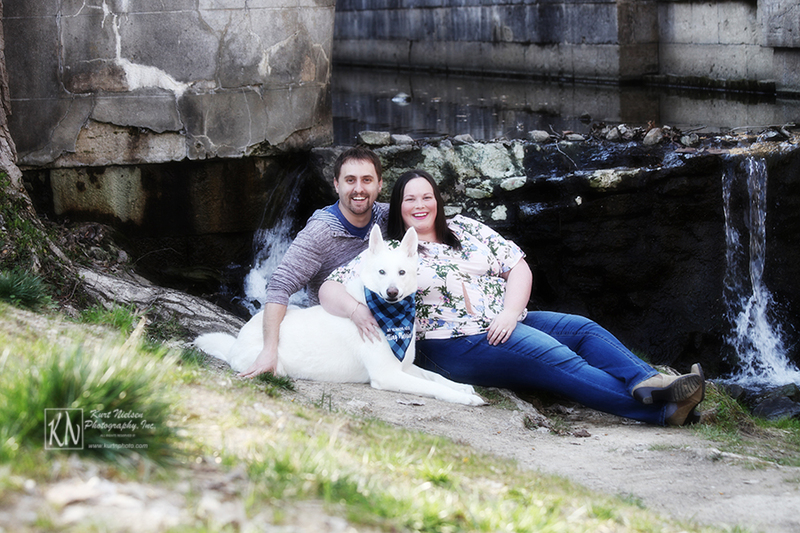 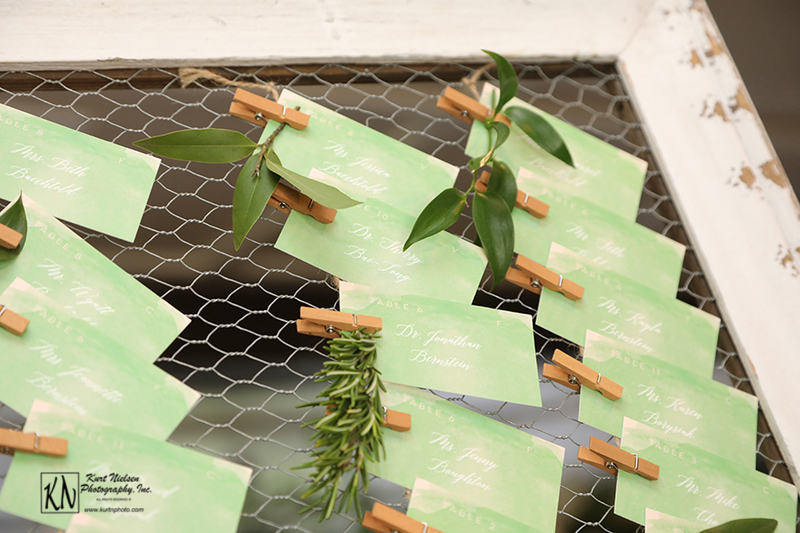 They incorporated their alma mater into their wedding details. 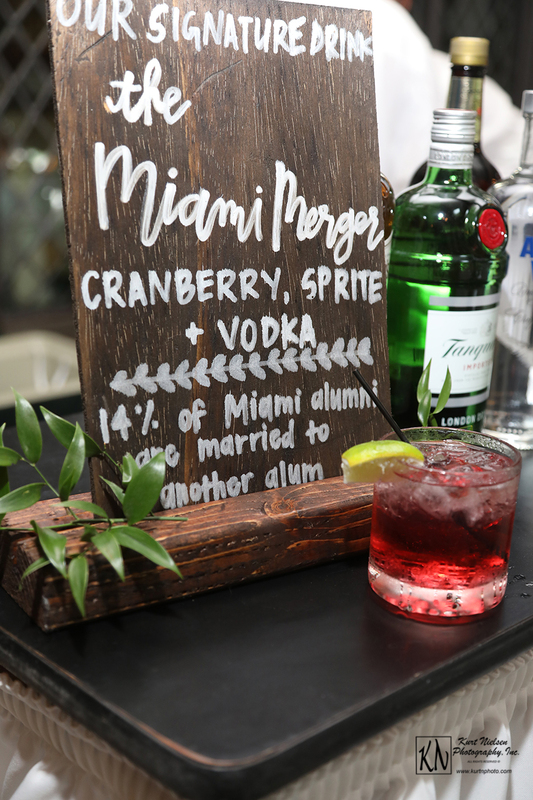 Their signature drink was aptly named “The Miami Merger.” This is the name given to Miami alumni who marry each other. 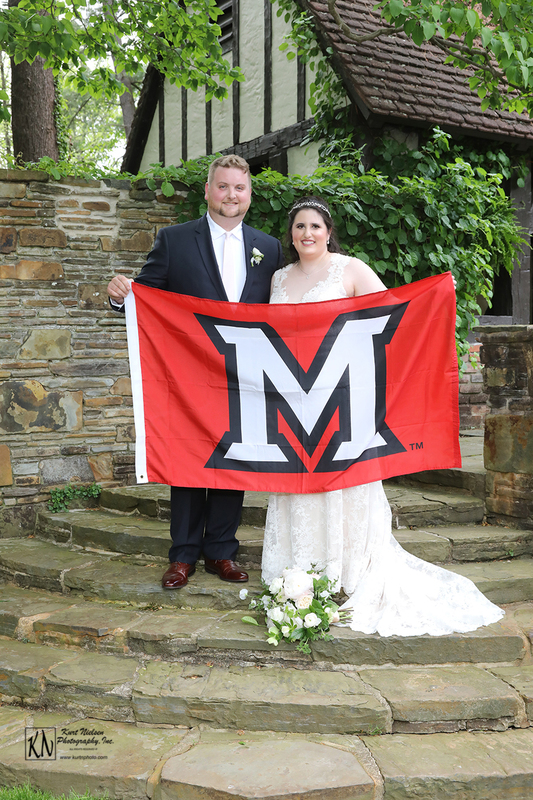 They also brought a Miami University flag to use for pictures of the couple and for use in the photo booth. 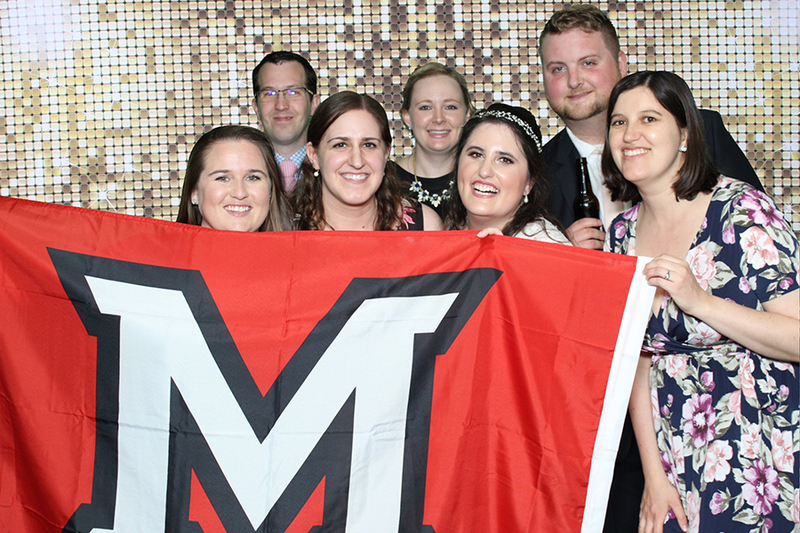 “Love and Honor” is a greeting used by Miami students and alumni and comes from the chorus in the school’s fight song. 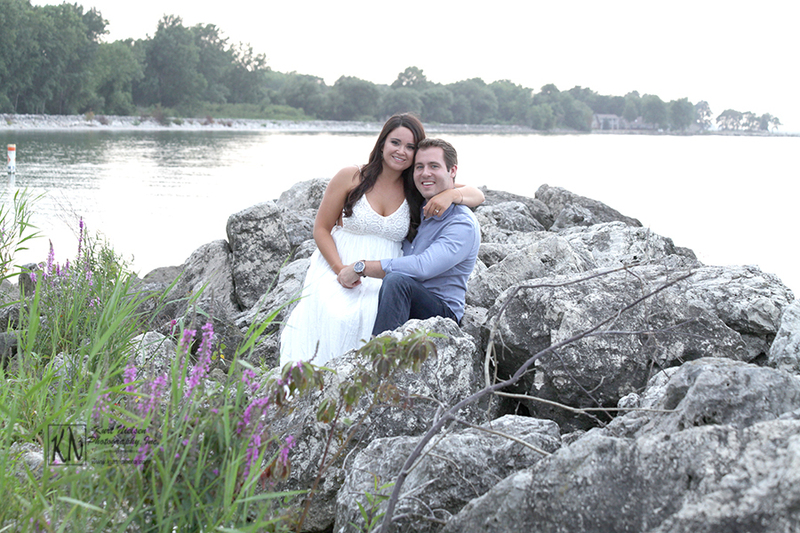 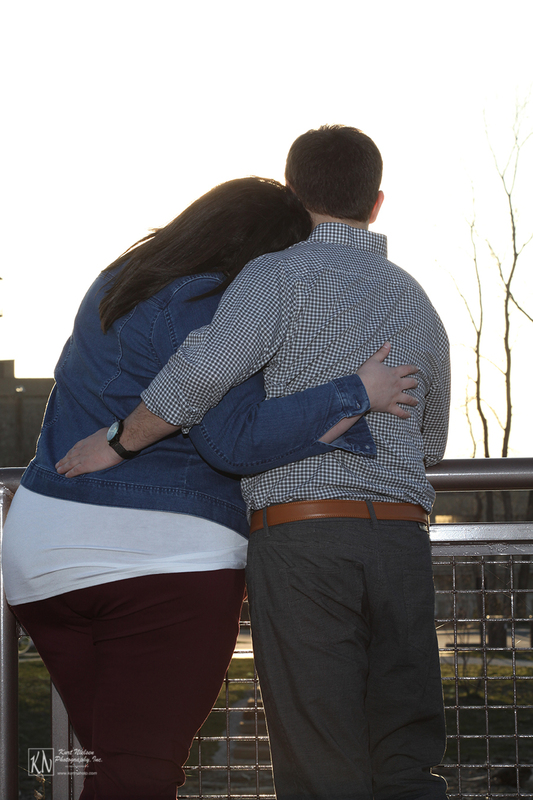 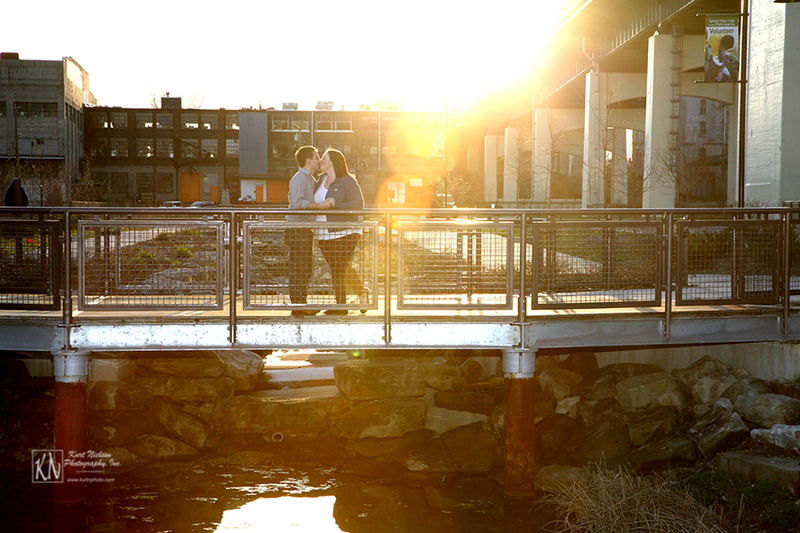 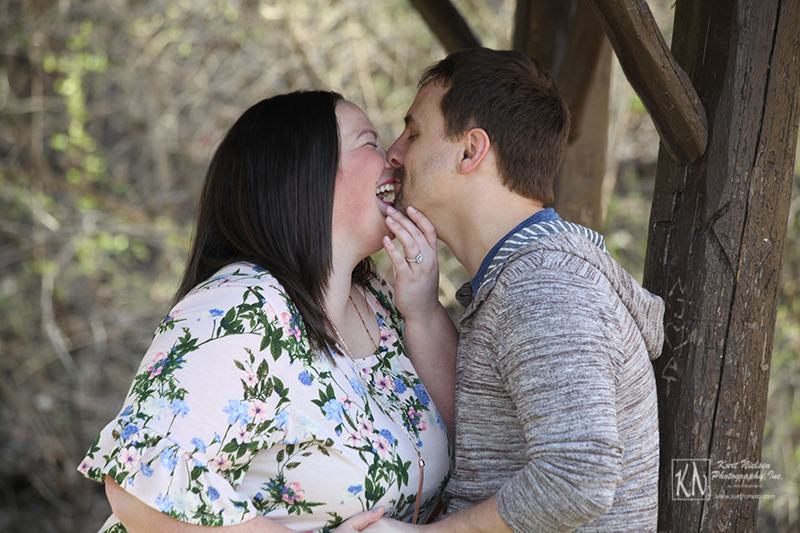 Michelle and Paul were able to steal away a little bit of time together before the reception. 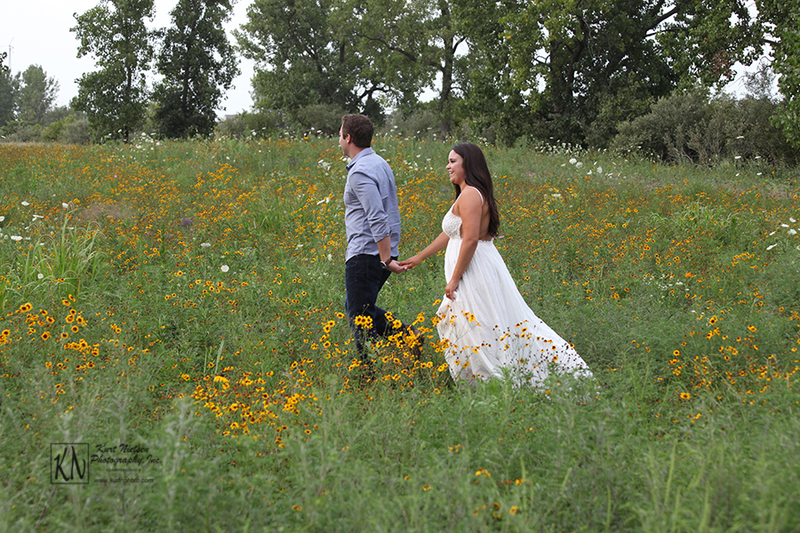 Then they headed right into the festivities. 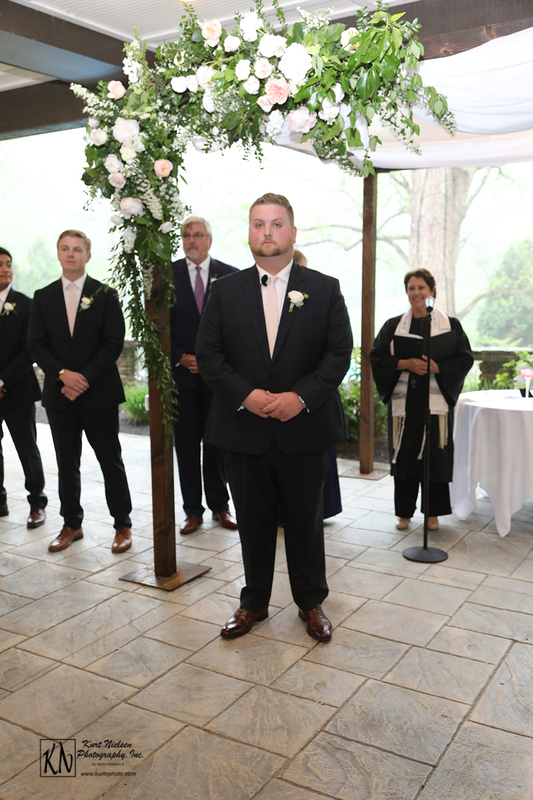 They started with the cake cutting and then the welcome speech. 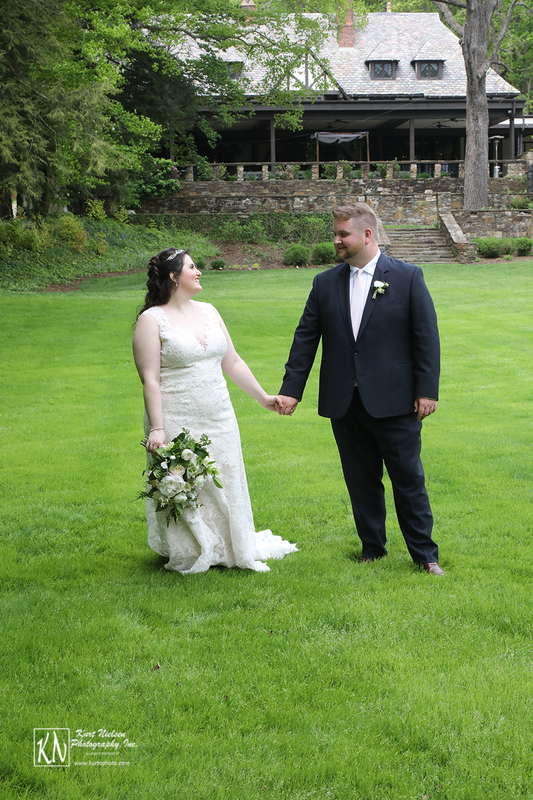 Although it was storming and we had a couple of power outages, the night was perfect! 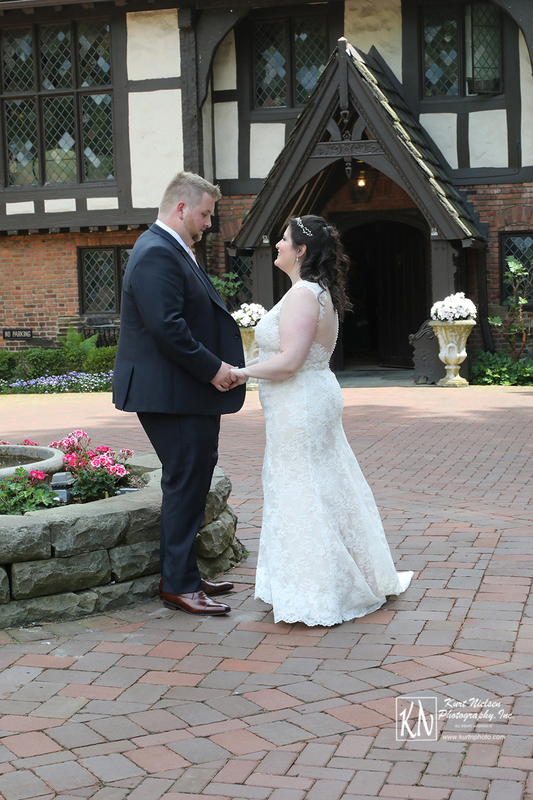 The guests celebrated the magical day through late into the evening with the help of DJ Mike Alexander from Cleveland Music Group.